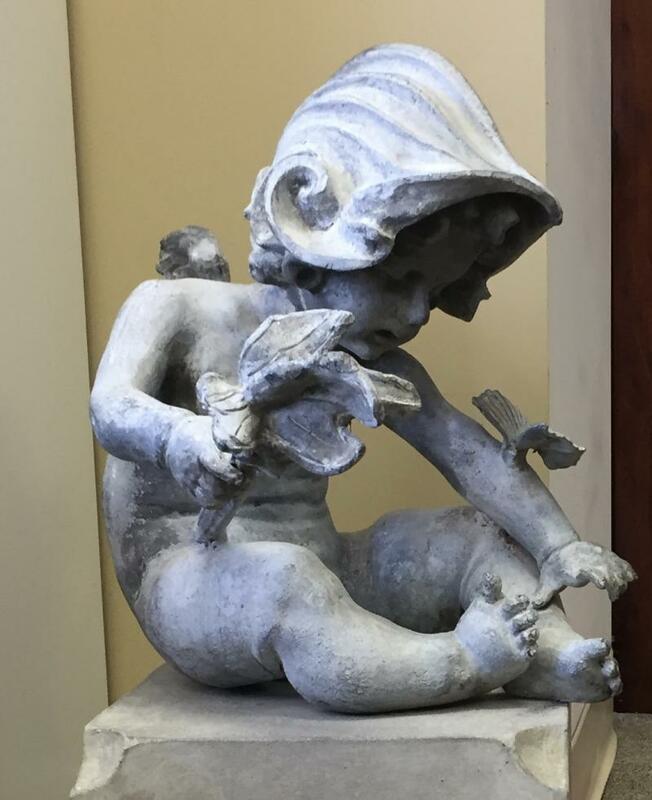 Lead putto garden statue emblematic of Peace with the devices of war including a helmet and torch. 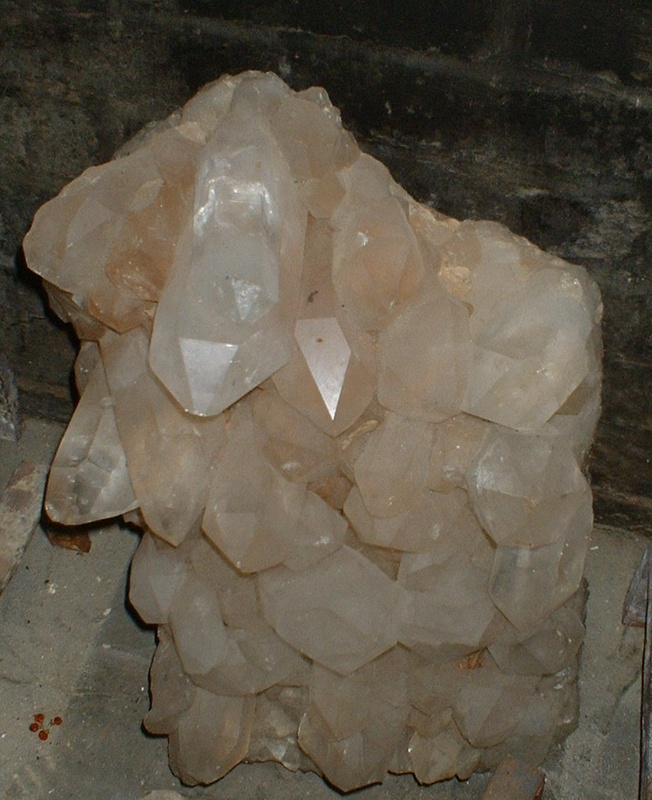 Sits atop a sandstone plintth. 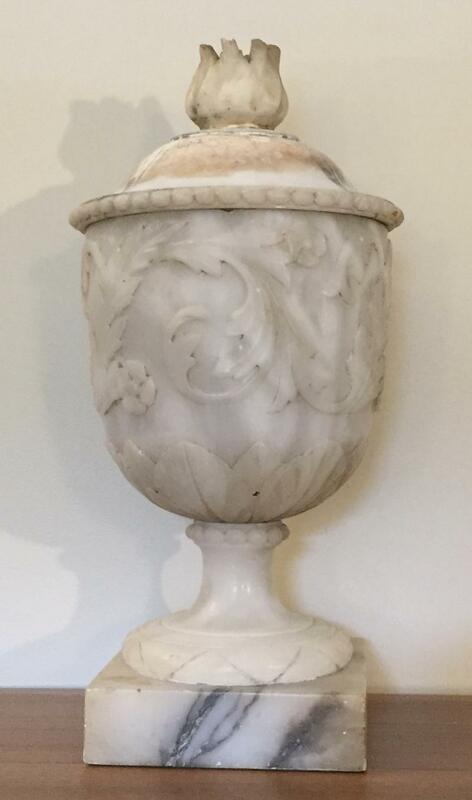 19th century Italian Grand Tour alabaster marble urn or pastille burner. 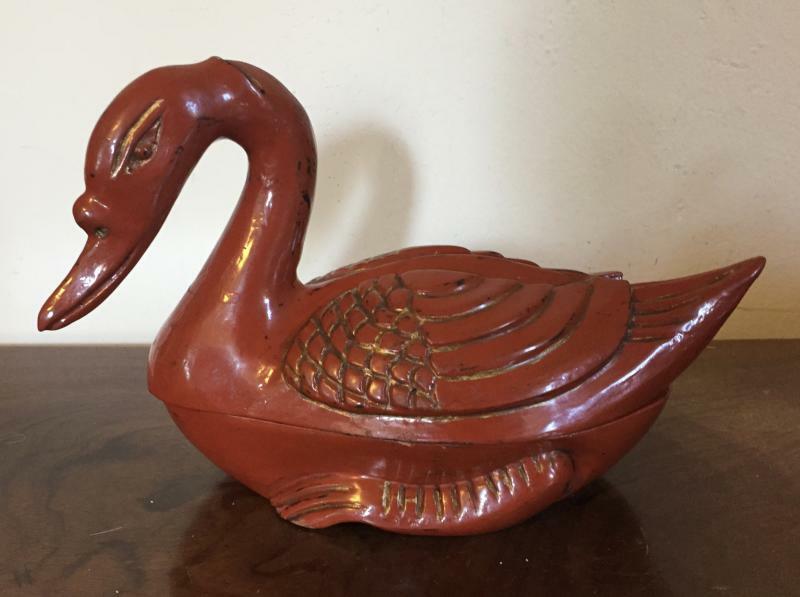 Chinese red lacquer carved wood duck form box. 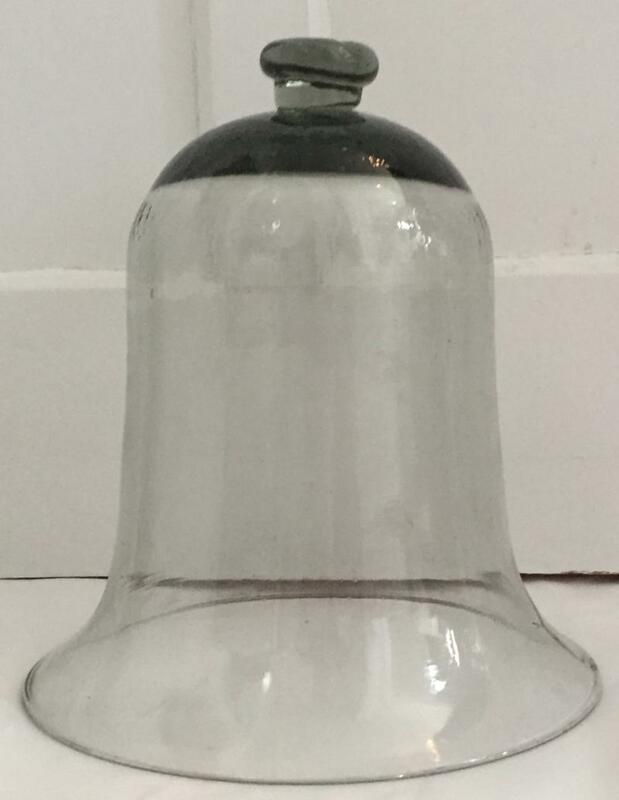 19th century French blown glass garden cloche for protecting or forcing outdoor plants. 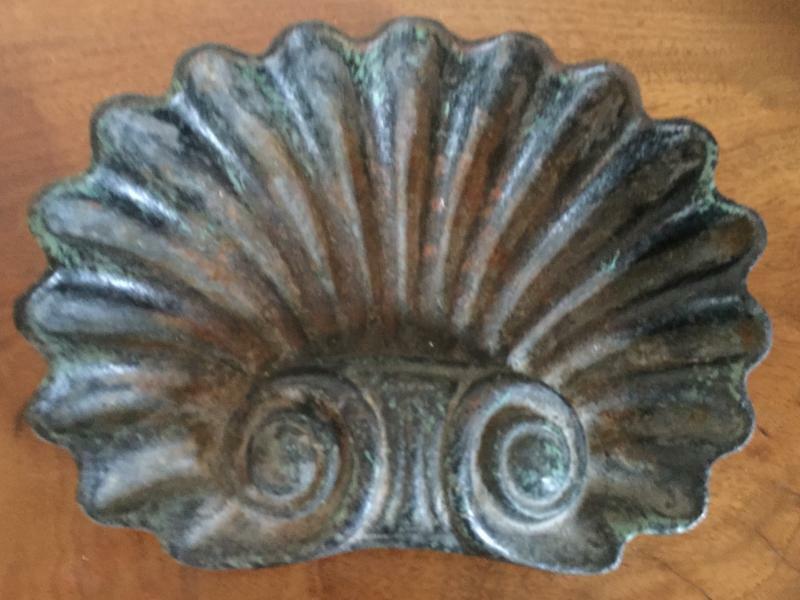 Large oblong Art Deco zinc planter with incised decoration. 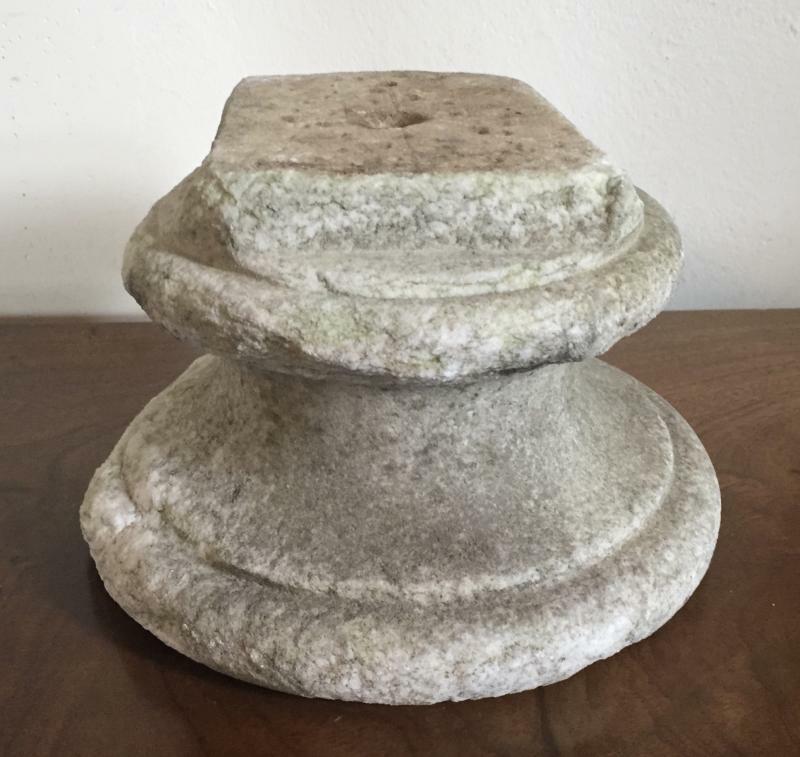 18th century carved white marble socle. 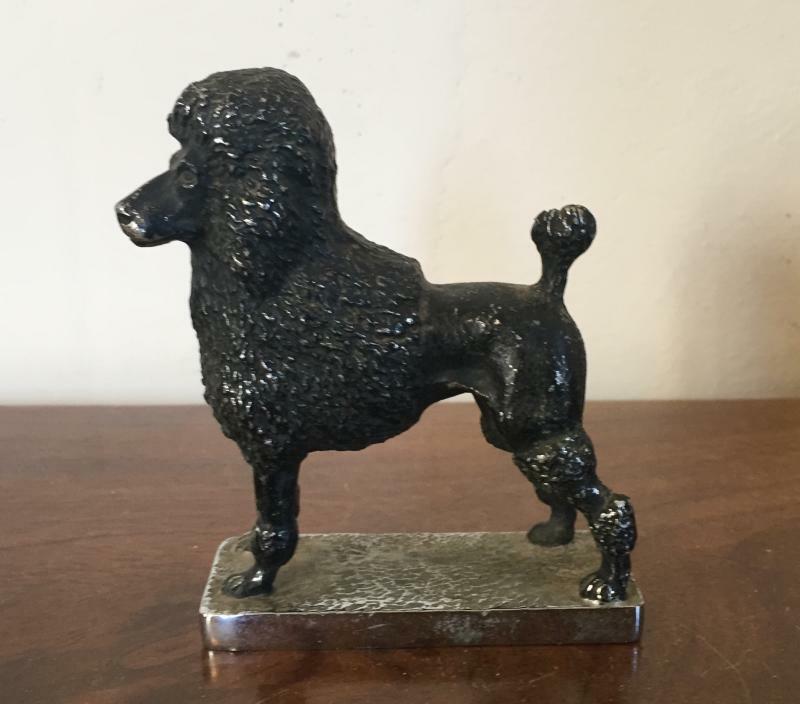 Standard French poodle bronze car mascot hood ornament. 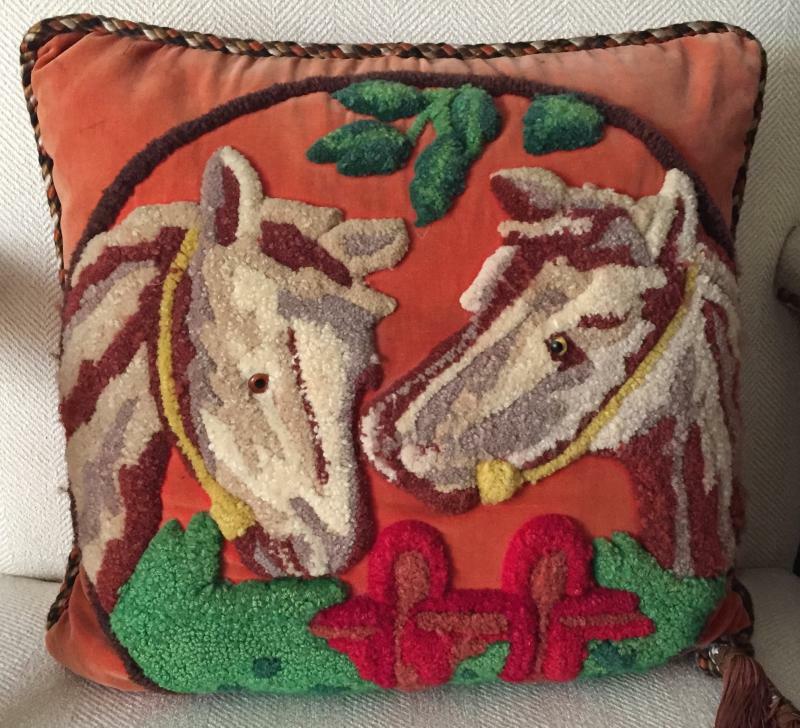 Victorian needlework stump work horse pillow on red velvet ground with silk braid and tassel. 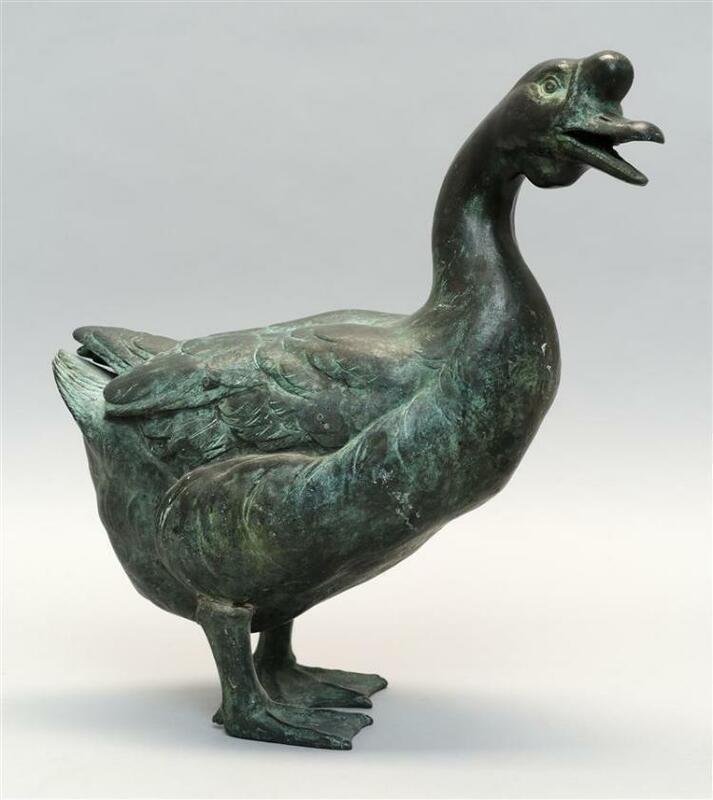 Bronze figure of a standing goose with verdigris patina. 19th century portable iron carriage hitching post. 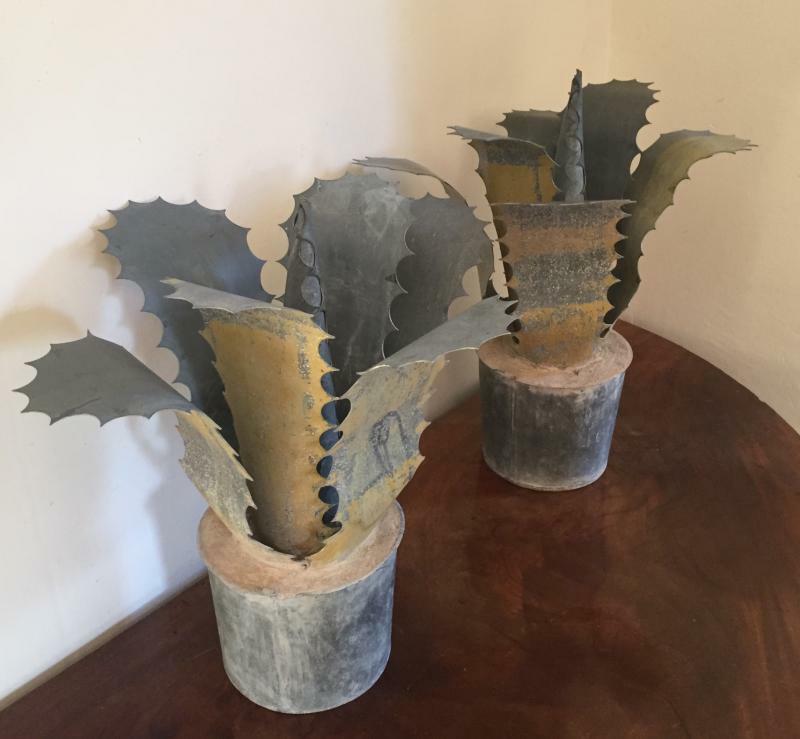 Pair crushed stone flower pots. 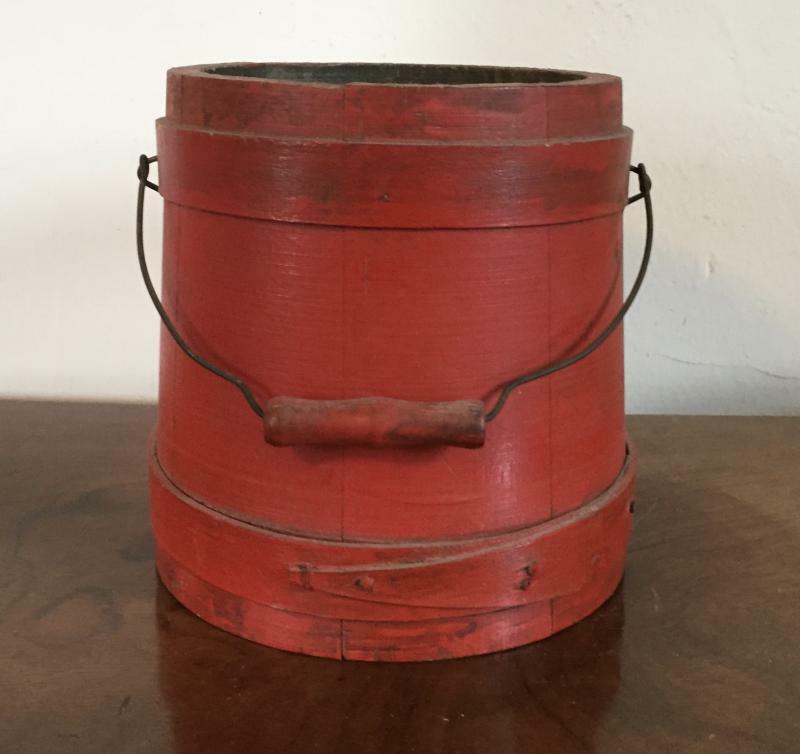 19th century paint decorated red firkin. 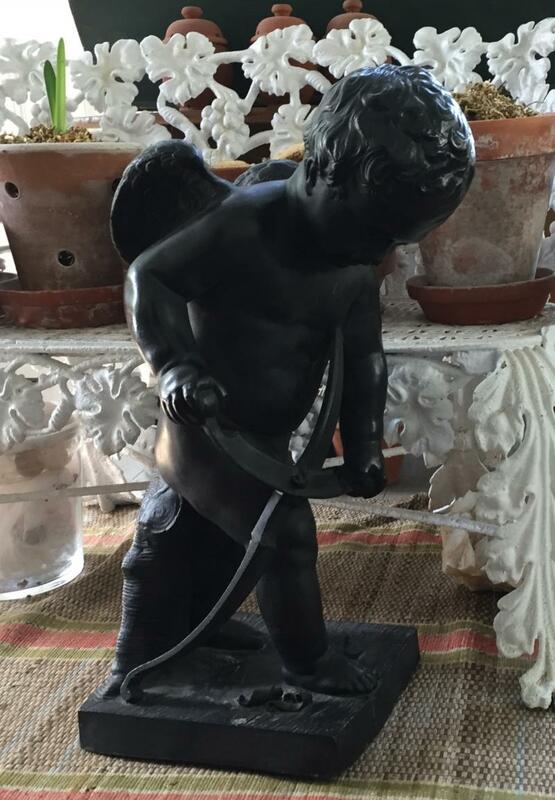 Zinc garden statue of winged Cupid wielding a drawknife to fashion his bow. Signed F. Ramingo. 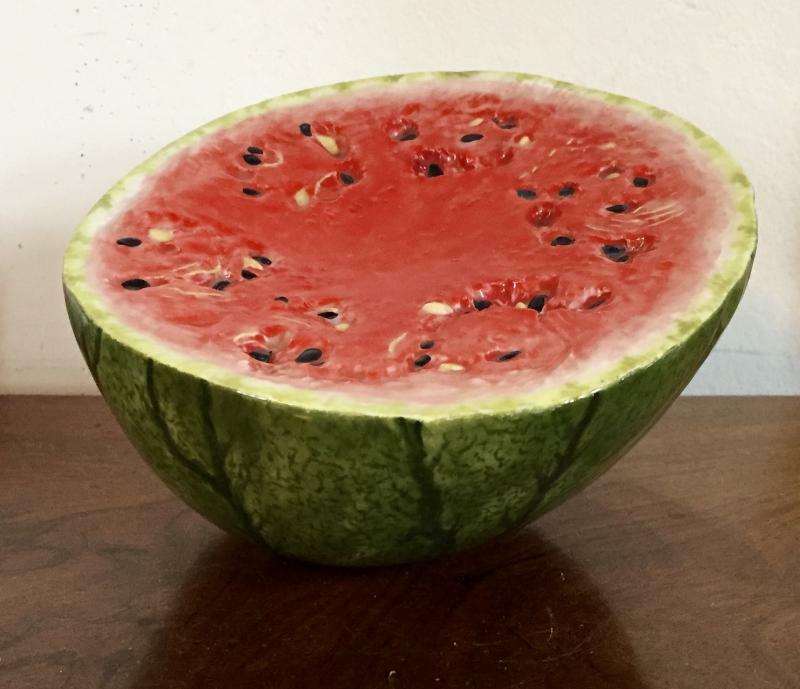 Porcelain sculpture of a watermelon. 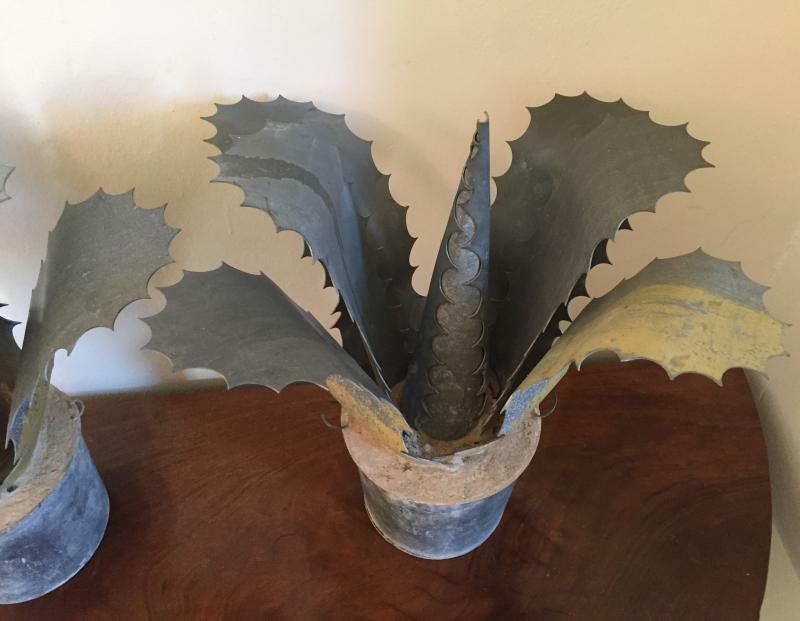 Pair French garden ornaments in the form of zinc aloe cacti in pots. 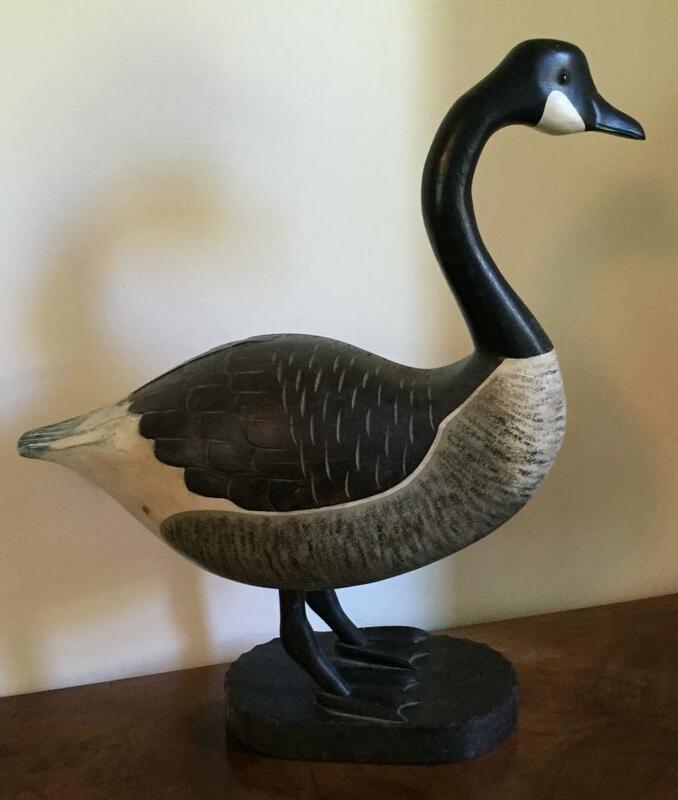 Life size carved wood and paint decorated Canada goose decoy. 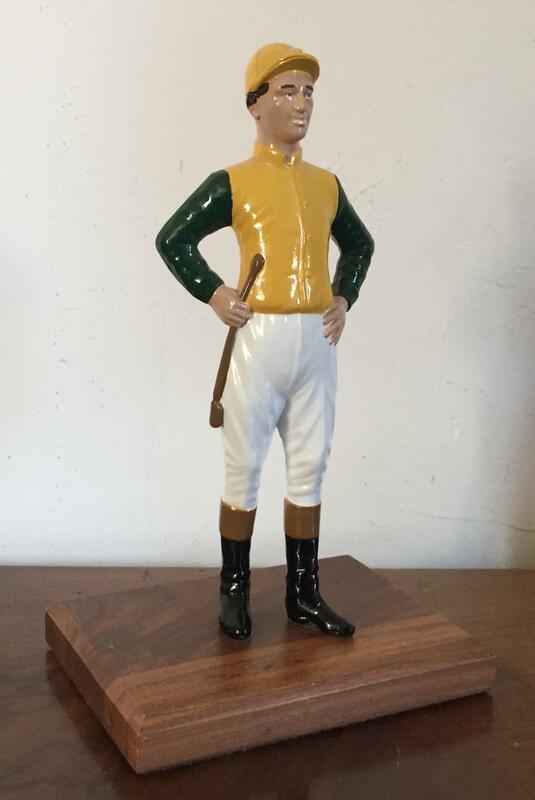 Lawn jockey dressed in silks - heavy weight - makes a great doorstop. Art Deco carved marble urn with cornucopia handles issuing fruit and flowers c. 1920. 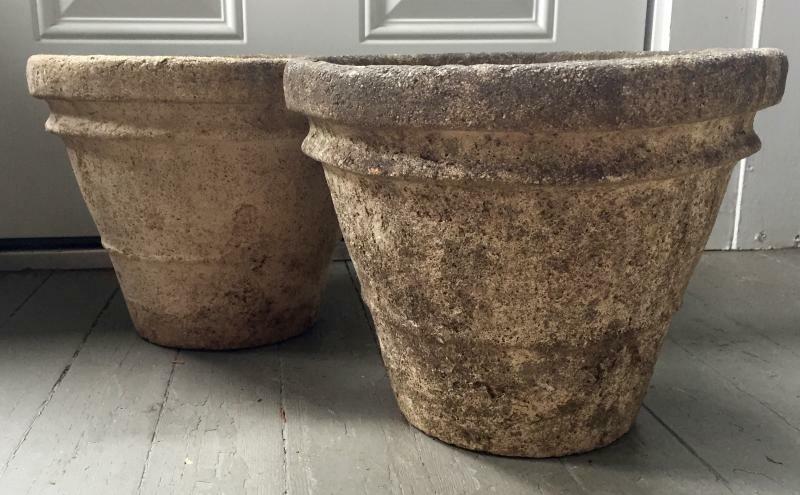 Large 19th century three part cast iron garden urn and stand. Compressed oval shape. 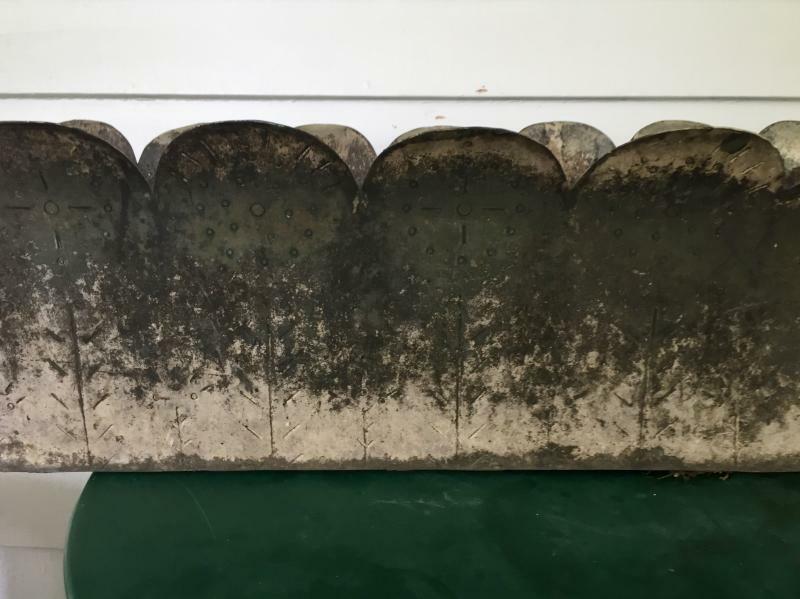 Crisp casting with original green paint decorated surface. Marked G. Hitzeroth 3124 Market Street Philadelphia. 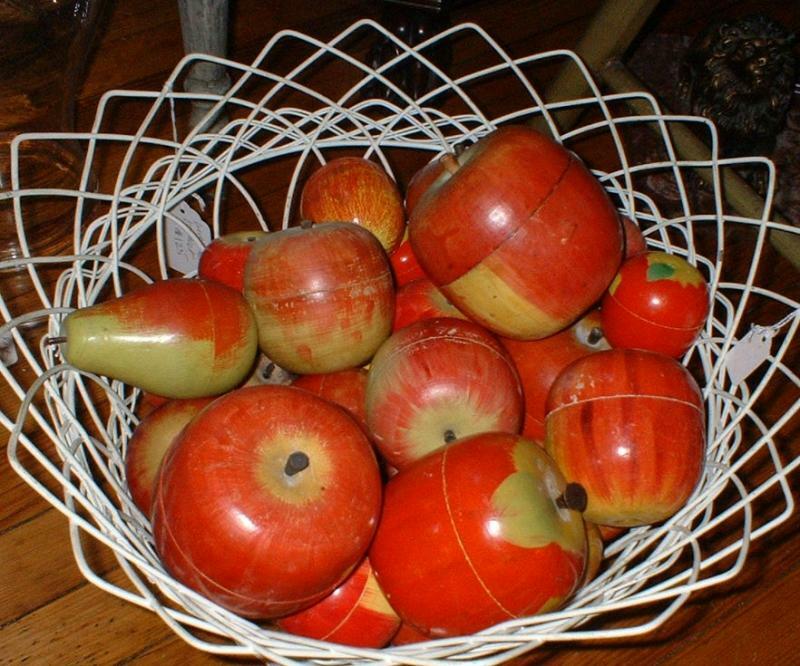 Pair 19th century Victorian fruit obelisks - glass domes with wax and papier mache fruit. Collection of 19th century Grand Tour agate paperweights. 19th century American cast iron door stop in the Greek Revival taste featuring an urn of flowers. 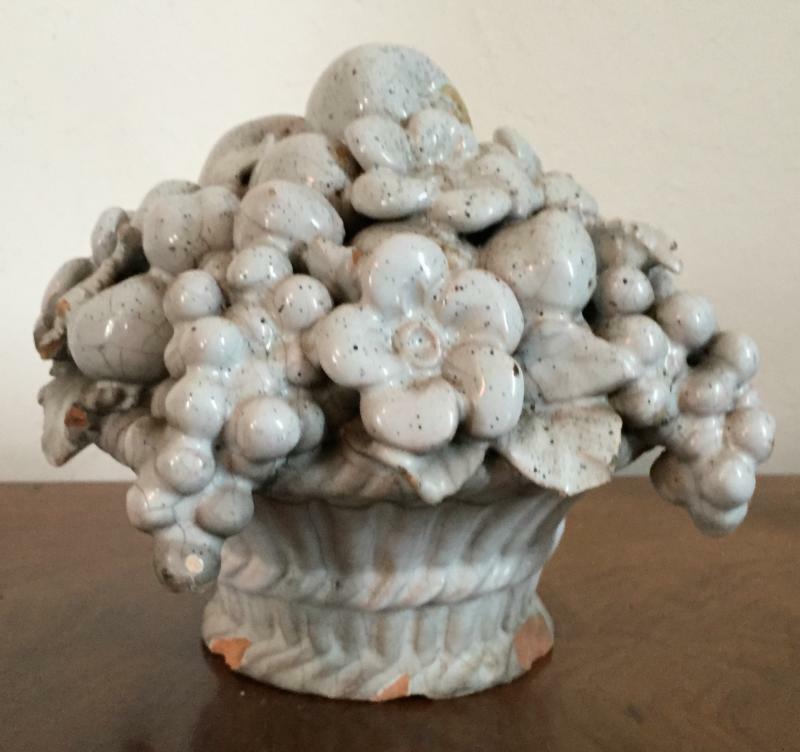 19th century carved coral bowl or planter from Palm Beach estate. 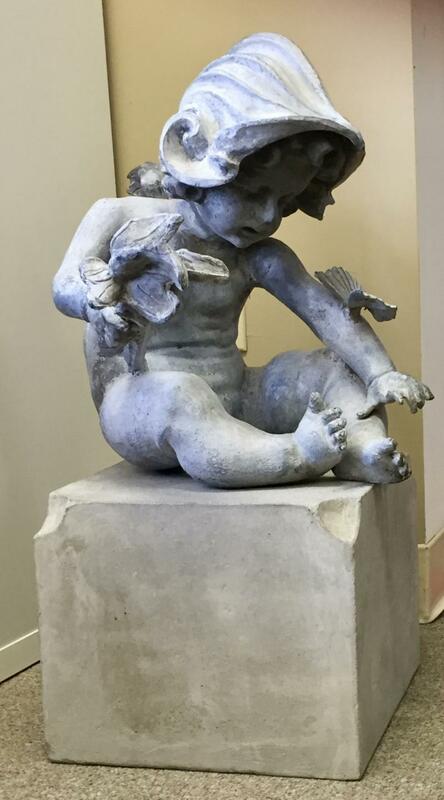 Carved Grand Tour neoclassical marble Piranesi urn after the Antique with plastered fininish. 19th century cast iron sea shell form garden ornament with original surface. 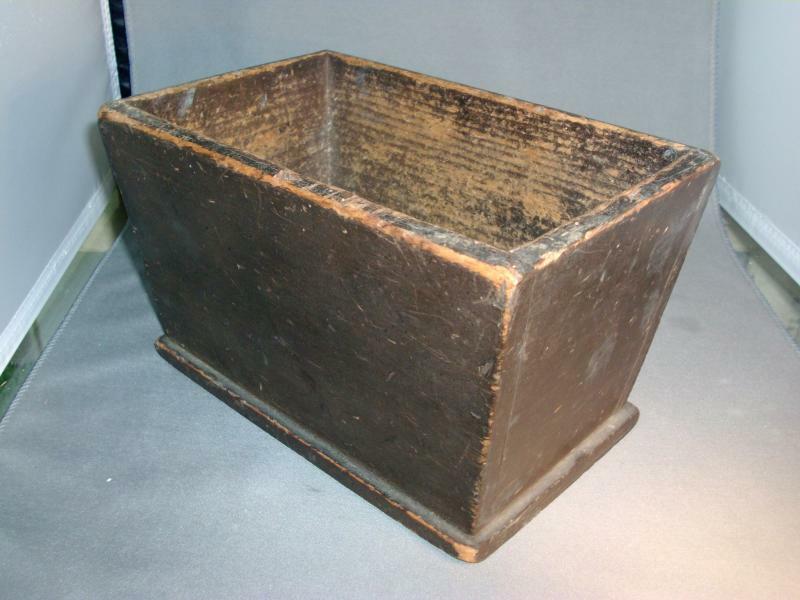 19th c. English tub.perfect for plants or ice. Two large Chinese carved wood lotus leaf display stands for porcelain or bronze censer - 19th century. Form of a lily pad. 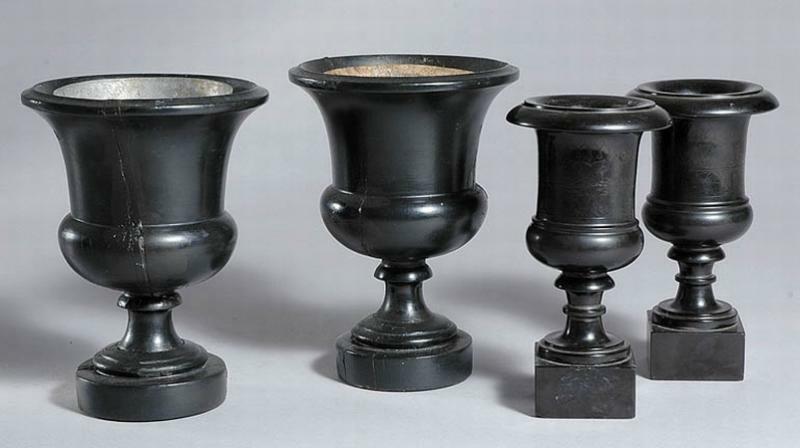 Pair Chinese hardwood brush pots with black grain - heavy weight. 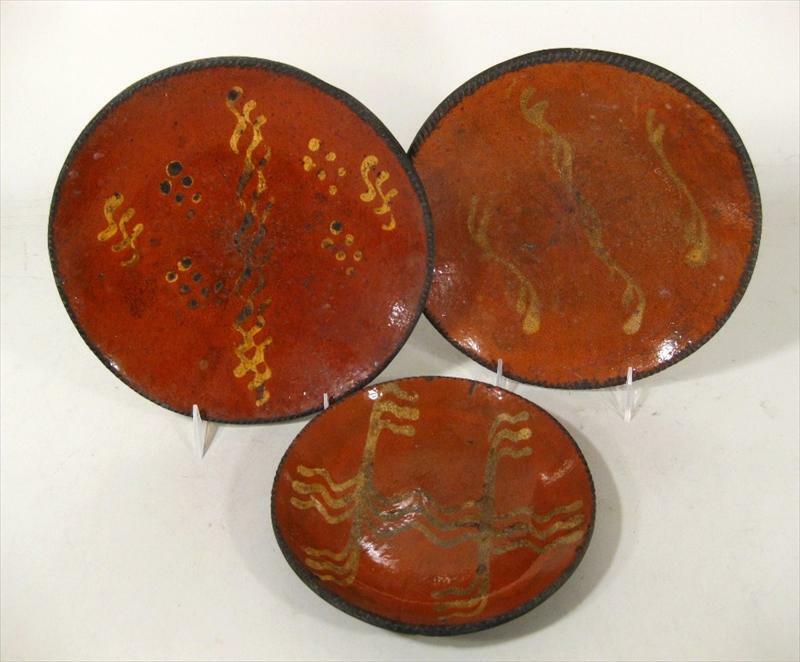 Three tin glazed terra cotta faience garden trophies - baskets with fruit and vegetables - late 19th / early 20th c.
19th century wire work baskets perfect for display of grand tour stone fruit. Large 19th century architectural element - terra cotta roof ornament in the form of a stylized owl. Pair Chinese carved jade bowls. Two pairs 19th c. mantle urns. Left pair is ebonized wood. Right pair is stone. Pair Chinese carved hard stone foo lions - 19th century. 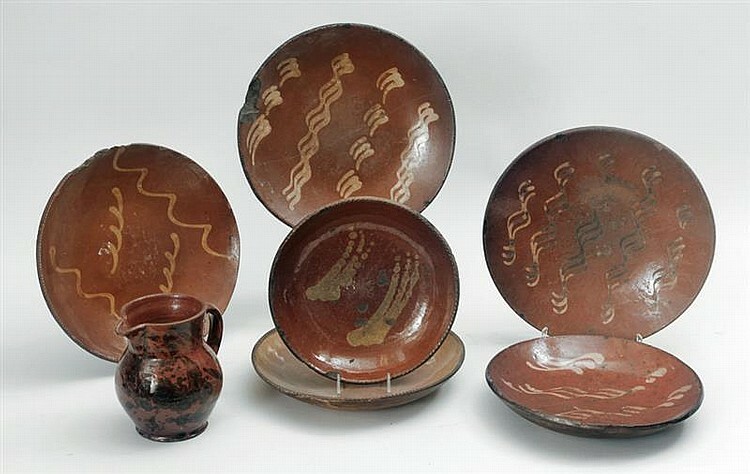 Selection of 19th century redware plates with slip decoration. 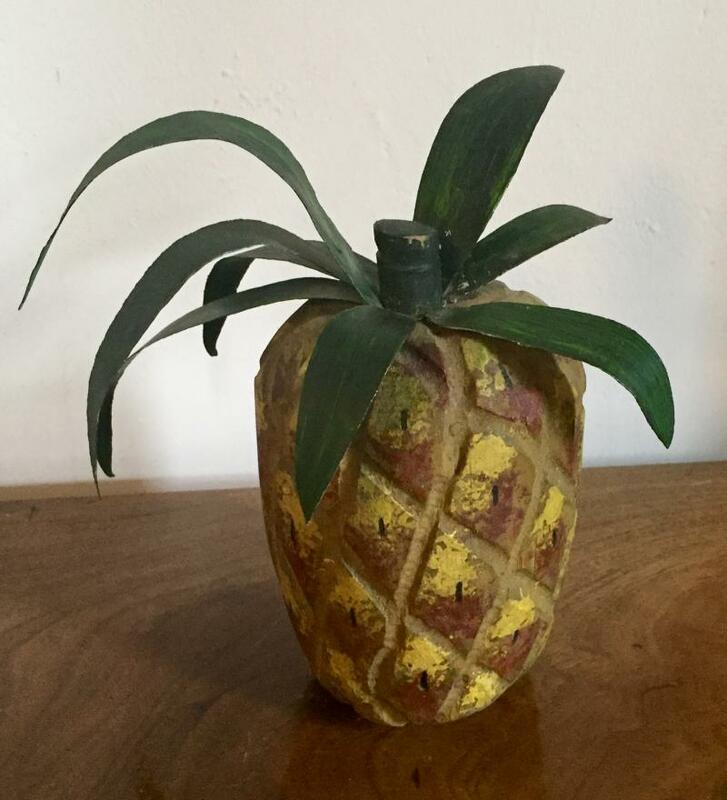 Large 1940's Florida Watts pot made of concrete and suitable for a lemon or palm tree. Measures 24 1/4" in diameter across the top x 20" tall. 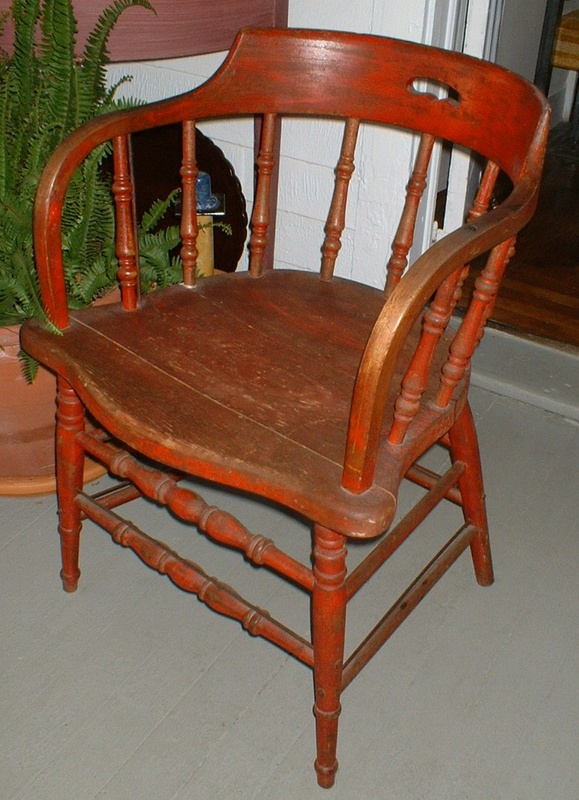 19th c. Tole monteith with original paint decorated surface. 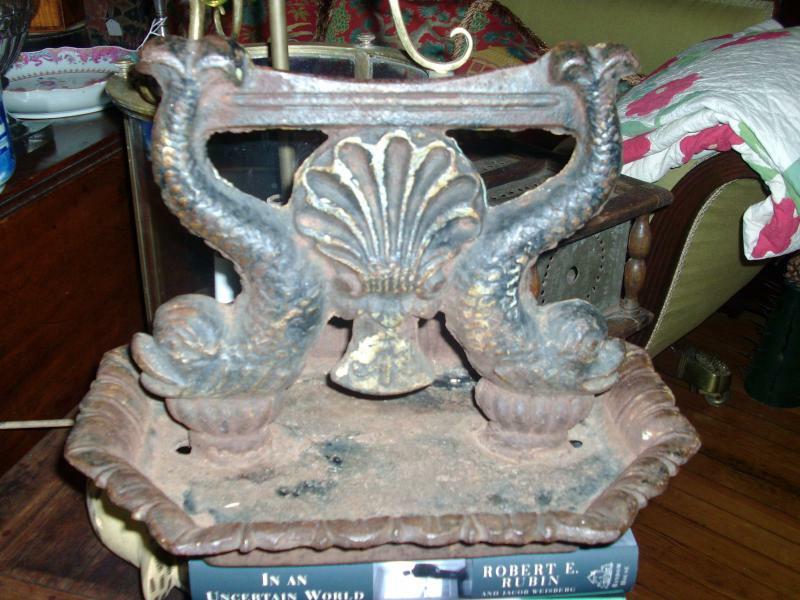 19th century American cast iron bird bath with shell form font resting on a dolphin's tail. 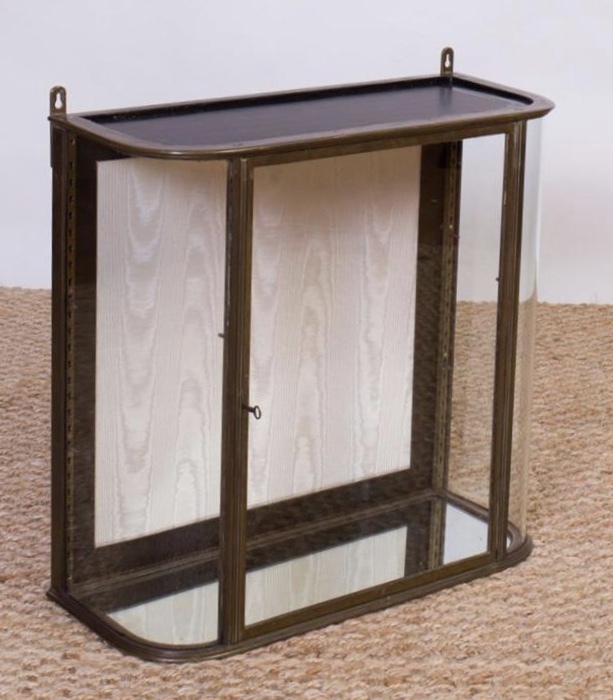 Chinese hardwood side table or display stand in the Art Deco taste. Zoomorphic archaic carved ink stone for calligraphy. 19th century solid cast iron door stop in the form of Bacchus or Dionysus with cornucopia handle. Original painted surface in shades of brown and green to simulate bronze patina. 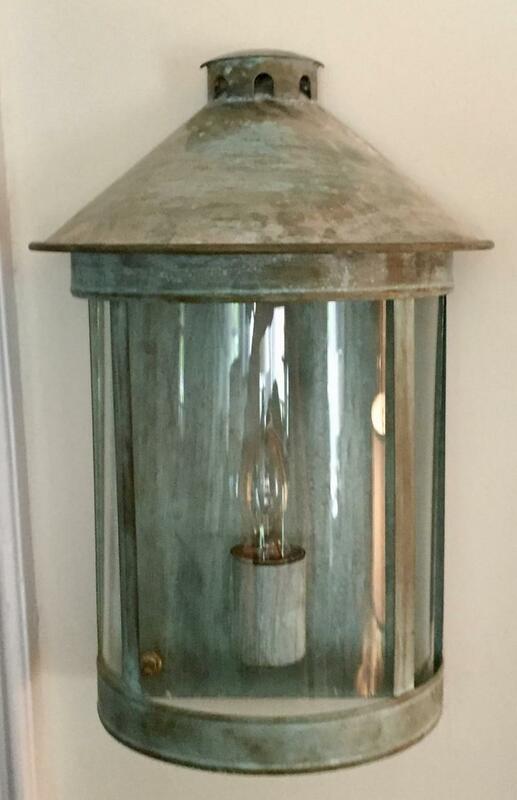 19th c. French tole lantern of elongated pagoda shape measuring 22.5" tall x 10.5" across the front x 8" deep. Original painted surface. 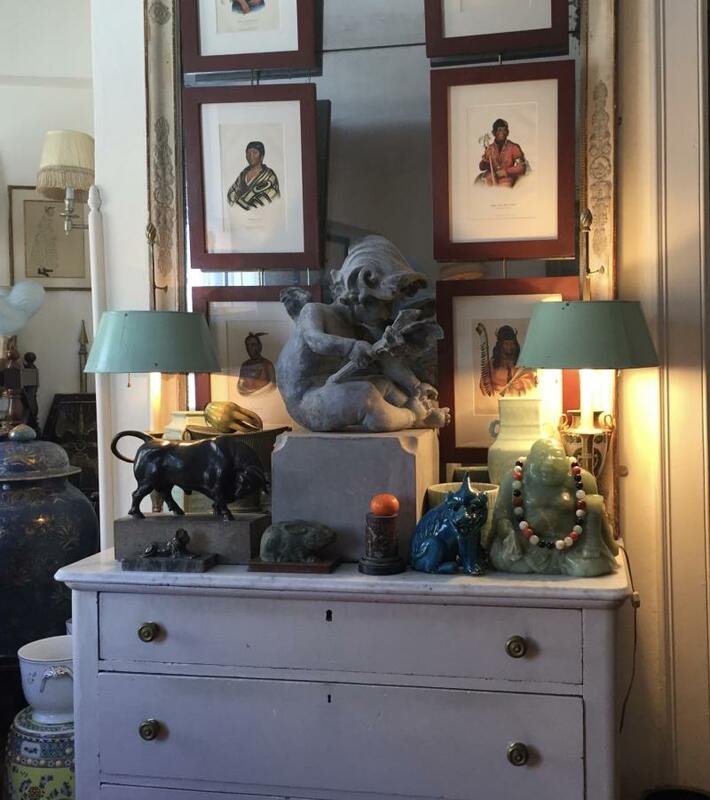 Provenance: Collection of David Barrett. 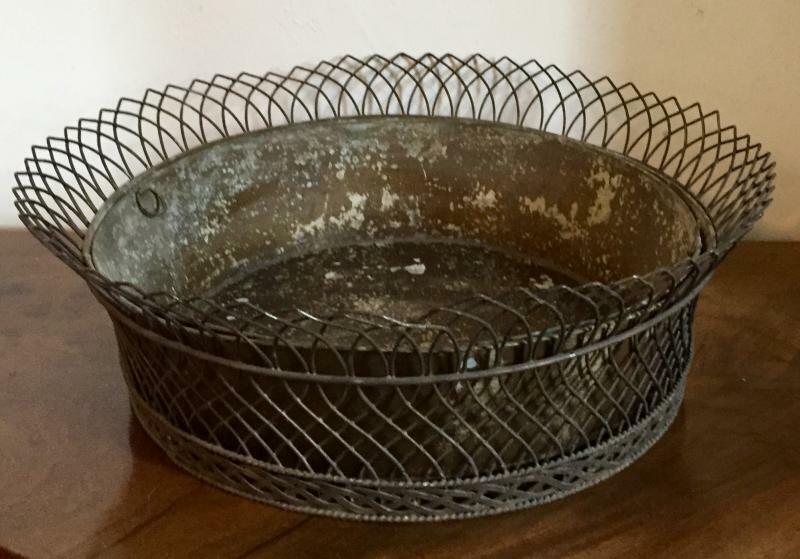 French 19th c. Victorian wire-work planter basket with zinc liner. Measures 18" x 16". 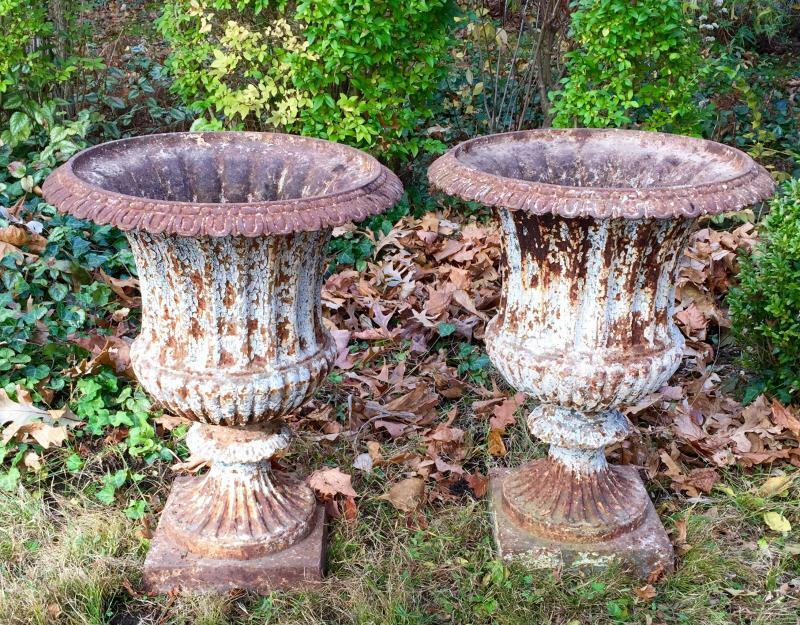 Pair 19th c. cast iron campana urns by J. L. Mott foundry New York City. Small 19th c. redware pot with beautiful pink orange glaze. Beautiful American Cast Iron Bench in the grapevine pattern. Note honeycomb seat, water leaf / acanthus legs and grape clusters cast more than 1" thick. Exceptional naturalistic detail, graceful outswept arms and heavy casting - c. 1860. Folk art candle box - hand carved; Southern origin. 19th century cast iron urn form gate post finial. 19th c. Victorian shadow box with wallpaper lining; deep metal box; floral arrangement. Vintage hand knit cardigan with hunting motifs. 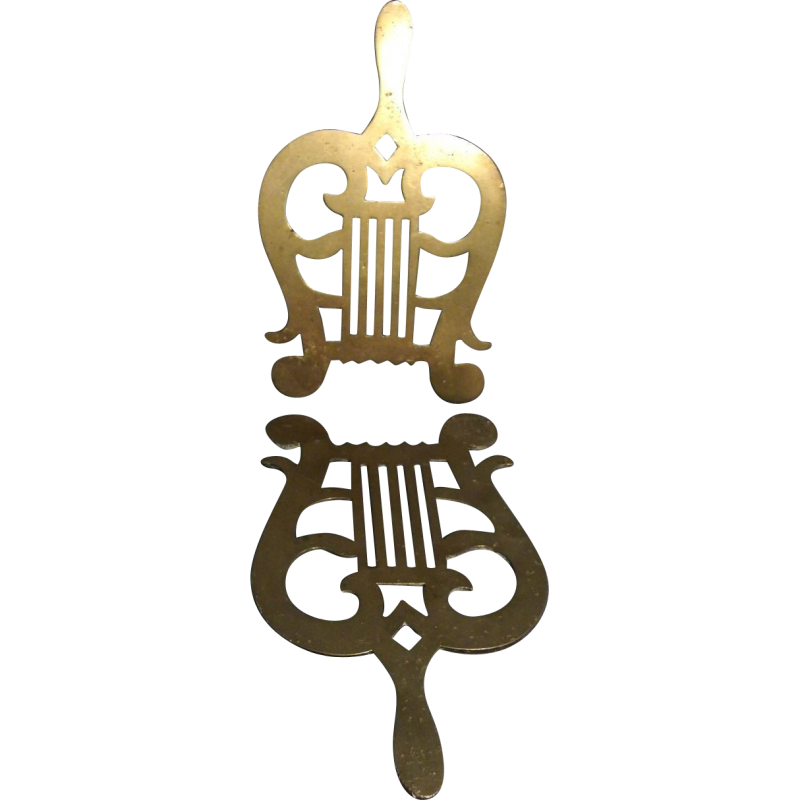 Pair 19th c. brass trivets in the form of lyres - for hearth or table. Regency Green Marble Urn with high stepped bases and ringed pedestal - early 19th c.
Victorian Wirework Plant Stand fully in the round - a rare form - with three tiers on castors. Virgiania Ovoid 3 Gallon Jugwit handles - early 19th c. Similar examples on display at Monticello. Maple Faux Bamboo Folding Side Table - 19th c.
1930's Paint Decorated Pull Toy. Head, legs and tail move. 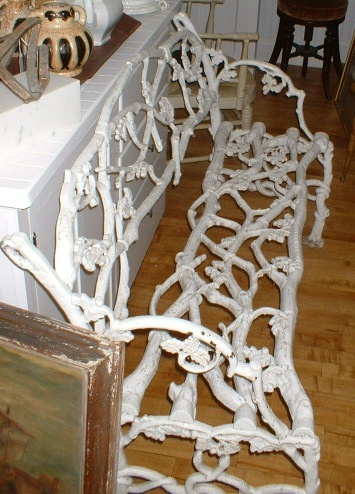 A fine mid 19th c. cast iron garden bench in the twig pattern manufactured in New York City by Janes Beebe & Co. This firm provided benches for the US Capitol and other buildings of similar stature. The bench is in great condition and is signed by the firm. Measurements: 49.5" long x 33.5" high x 20" deep. 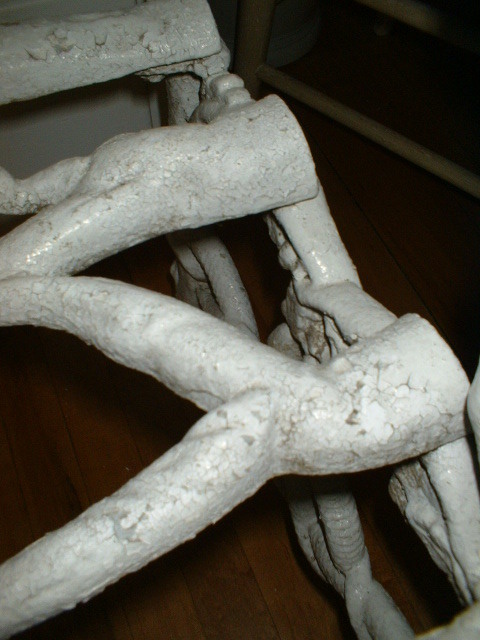 Portable iron hitching post - 19th c.
Victorian Wirework Plant Stand on castors. Crescent shape, three tier - 19th c. Another available in white - full round rare form. 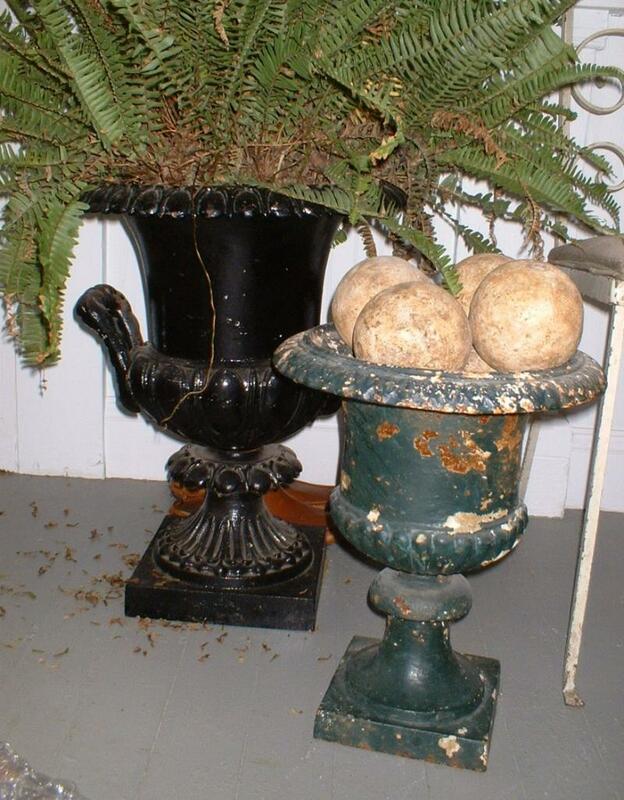 PAIR American Cast Iron Urns with handles (pictured left with fern). 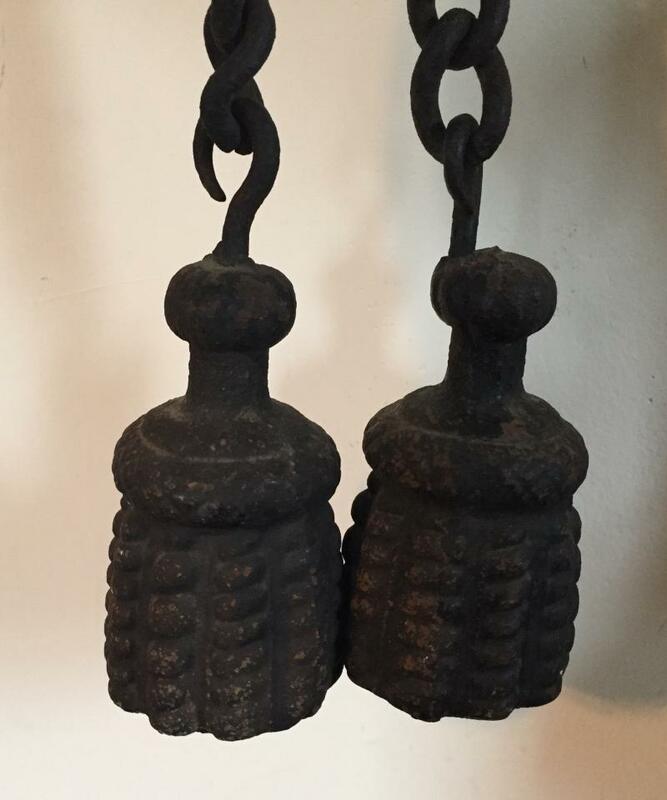 Massachusetts Federal Gate Finials in original surface c. 1820. Collection of Hand Thrown Seed Potsin original green painted wood trays. 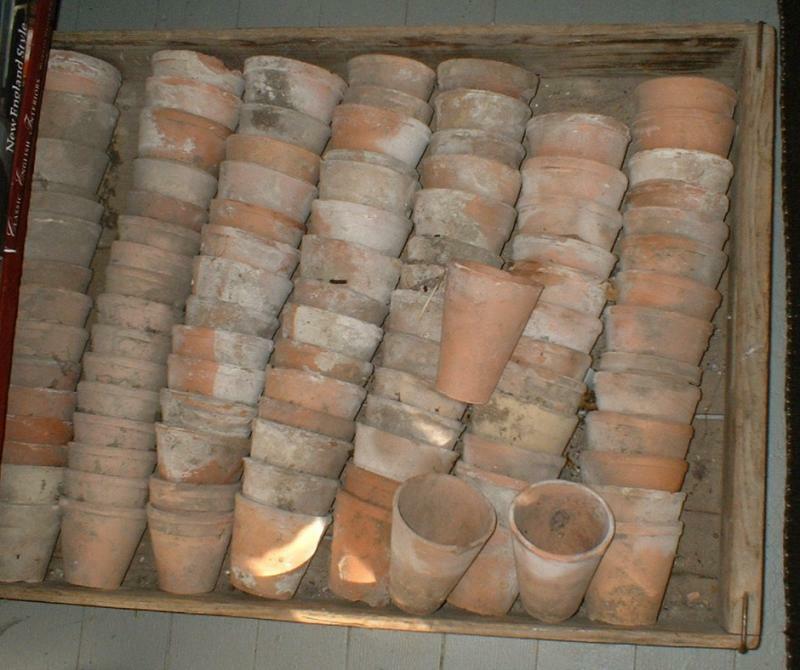 Three pallets each containing more than 100 terra cotta pots - c. 1910. Victorian Red Painted Armchair in original surface - c. late 19th c.
Measurements: 30" high x 23" across the front. 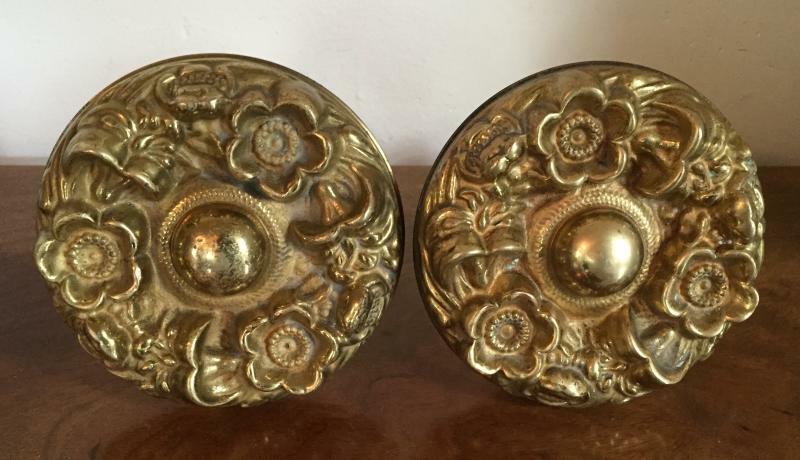 Collection of Stone Fruit - 19th c.
Large 19th c. gilt brass drapery tie backs. 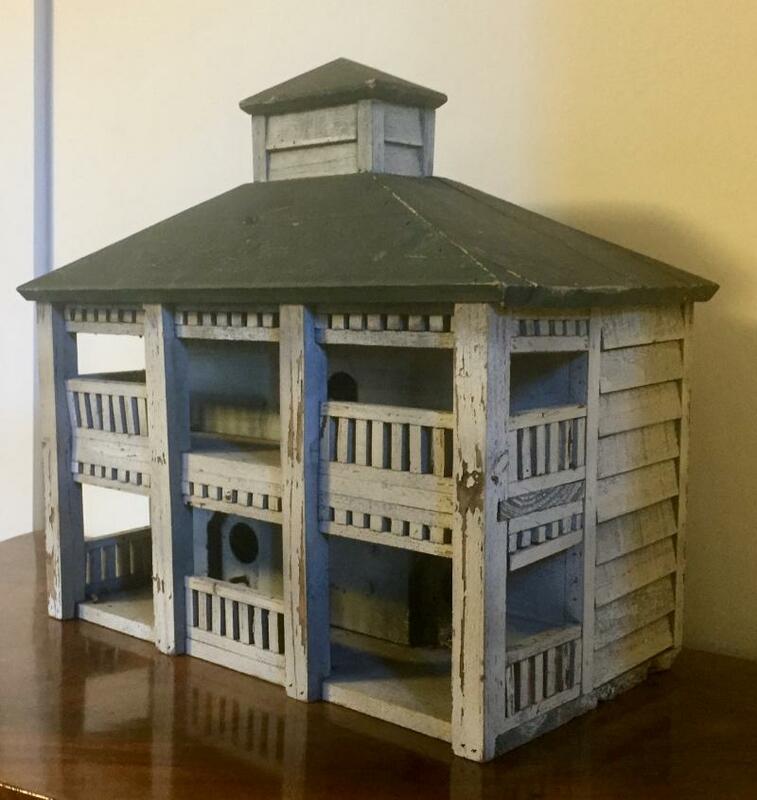 New York State Hudson Valley paint decorated classical architectural model bird house. 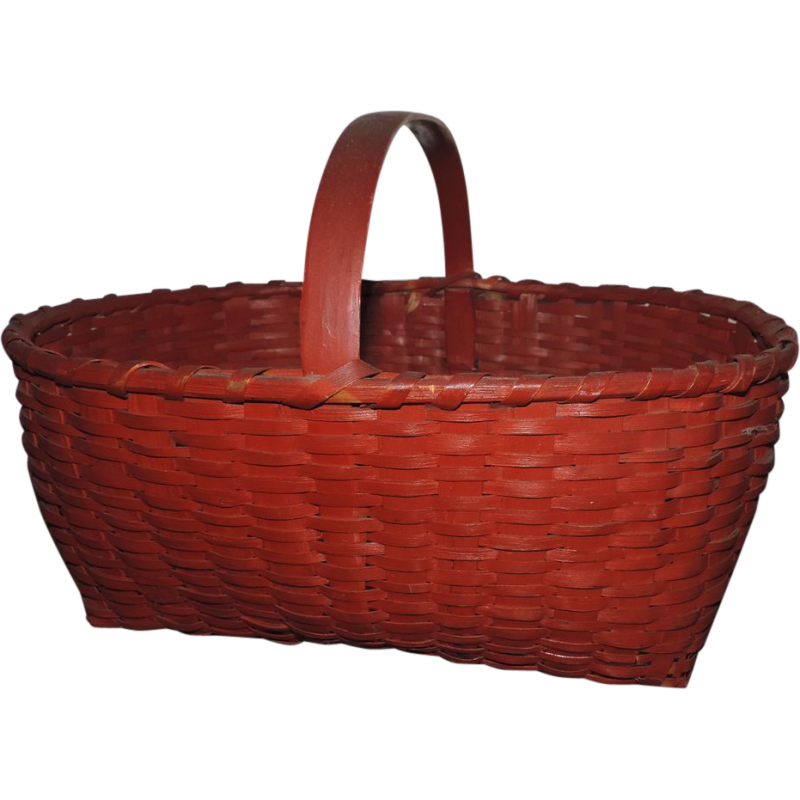 Large Native American Indian Papago oval basket with two handles and flower decoration. 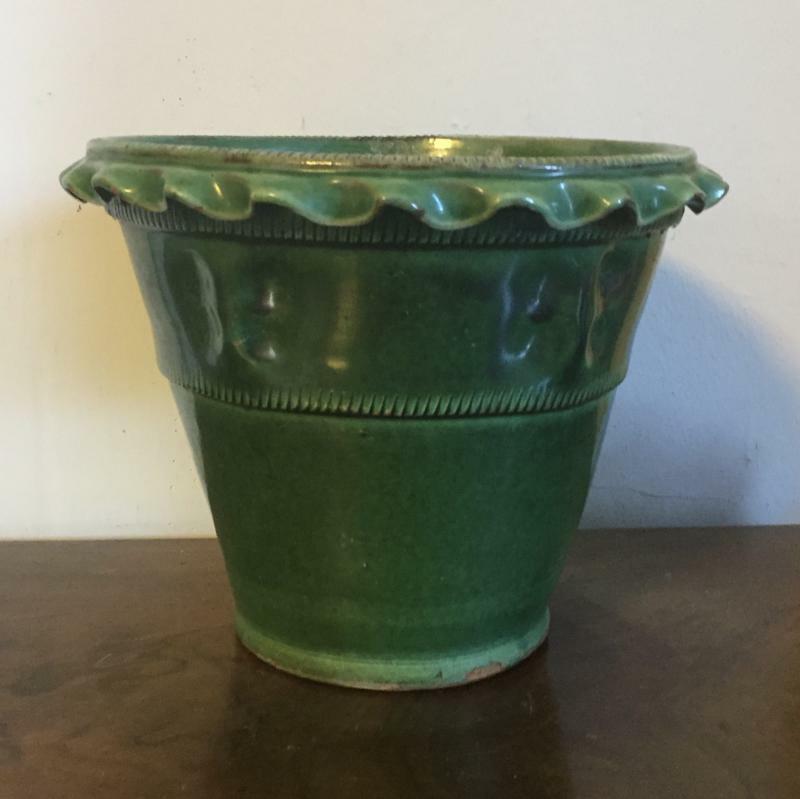 19th century French green glaze terracotta flower pot. 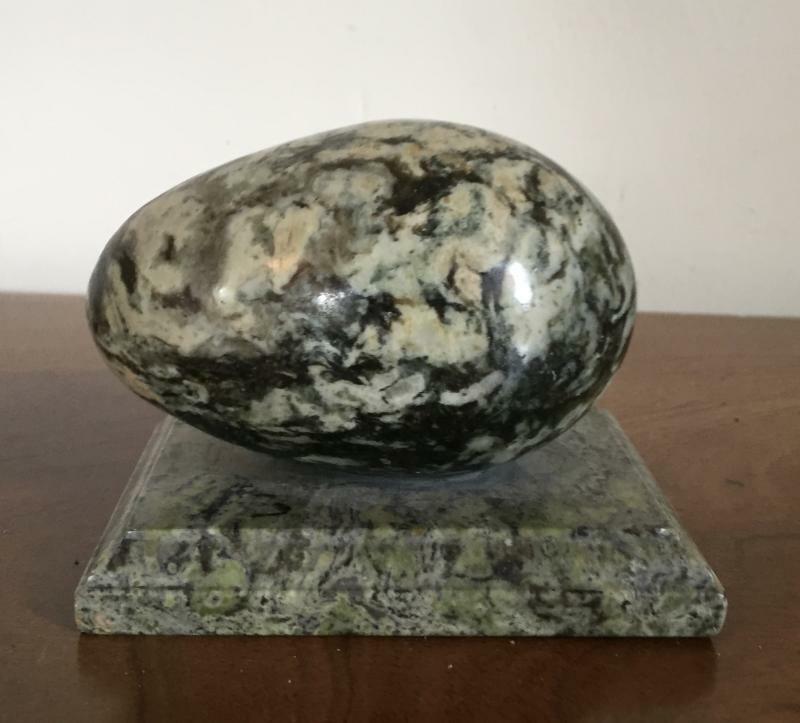 Grand tour specimen marble egg paperweight. Large 19th century French wirework round centerpiece basket with tole liner. 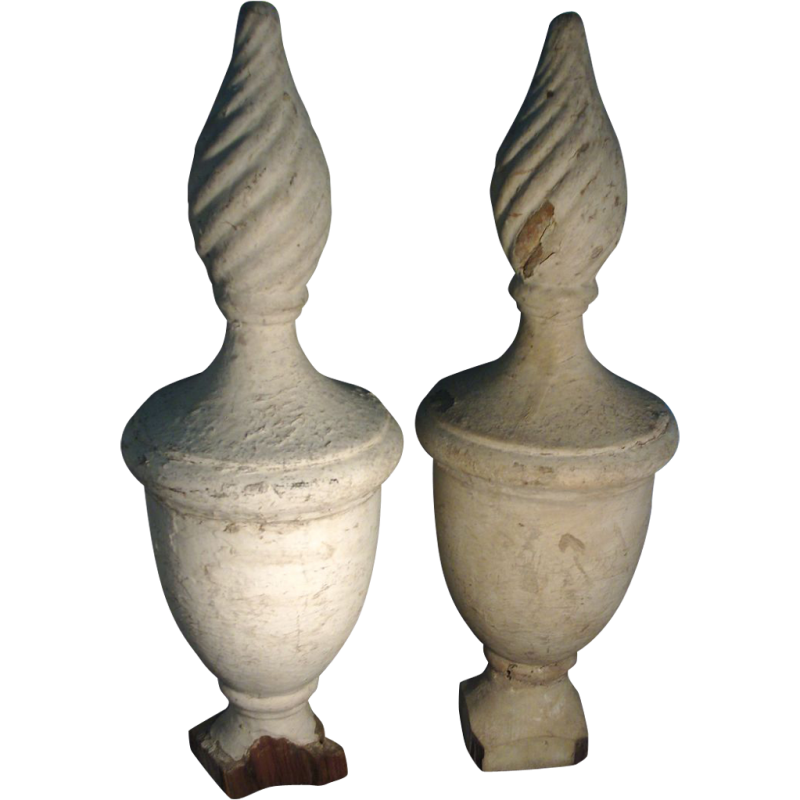 Large pair terracotta gate post finials. Set 5 custom made verdigris copper & curved glass wall sconce lanterns by Marston & Langinger, London. 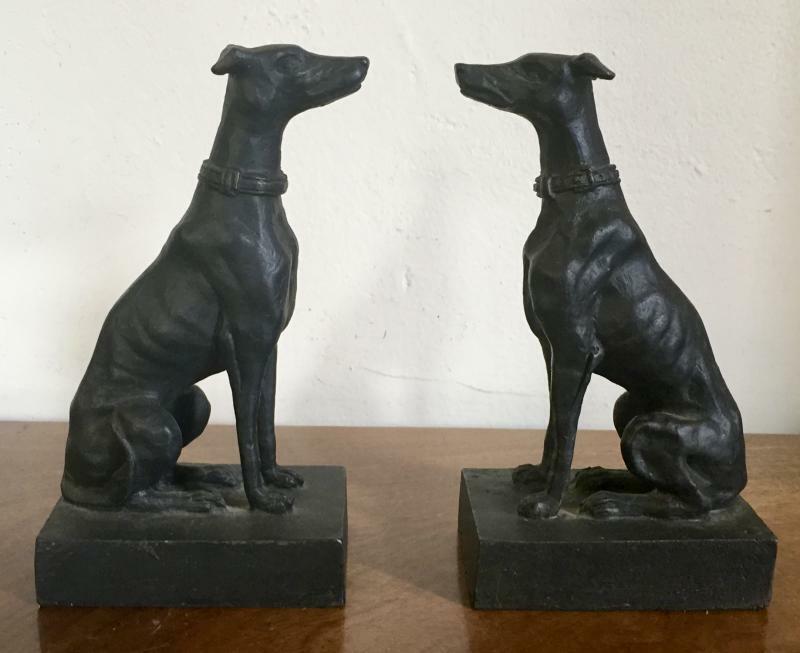 Pair cast iron whippets measuring 7 1/8" tall. Virginia folk art carved wood, tin and paint decorated sculpture of a pineapple. 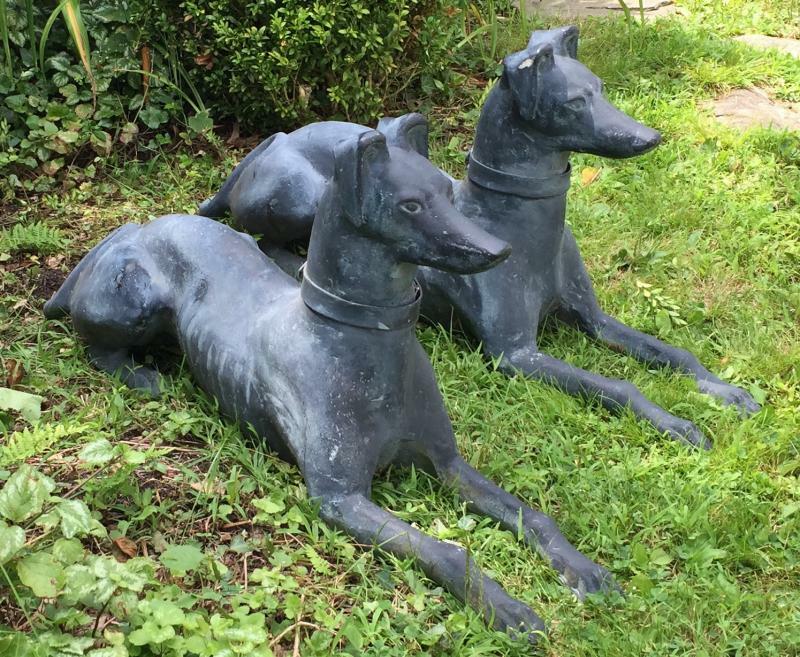 Pair lead whippet garden ornaments. 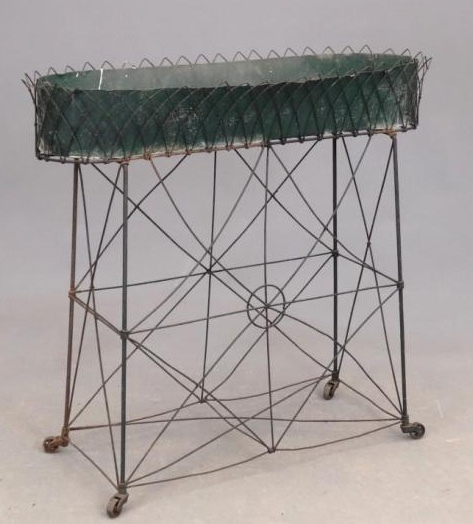 Antique 19th century French wirework plant stand with tole liner in original green paint. 19th century brass and curved glass hanging wall display shelf vitrine. 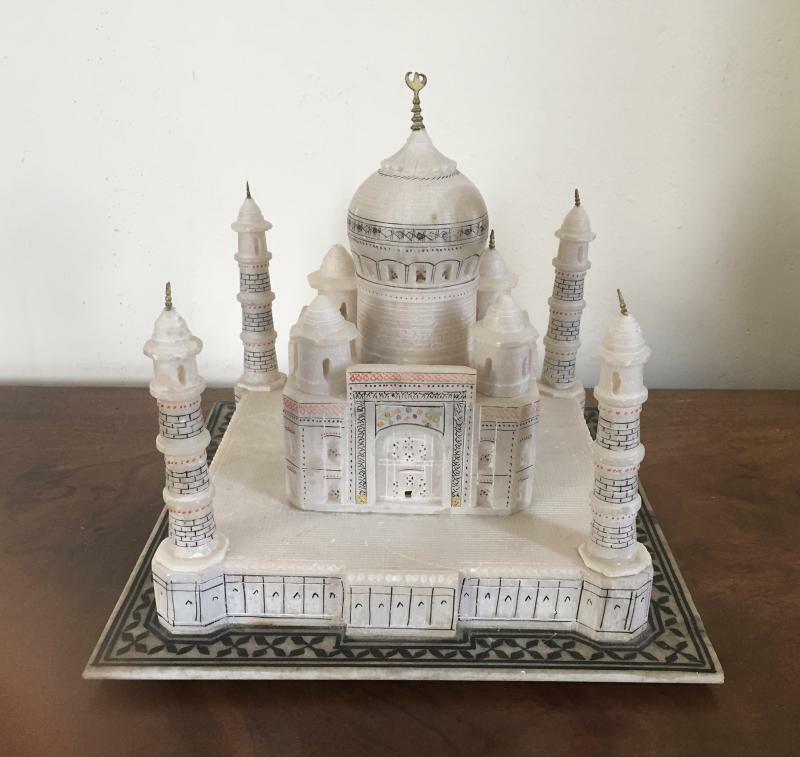 Carved alabaster architectural model of the Taj Mahal. 19th century Grand Tour souvenir from India. 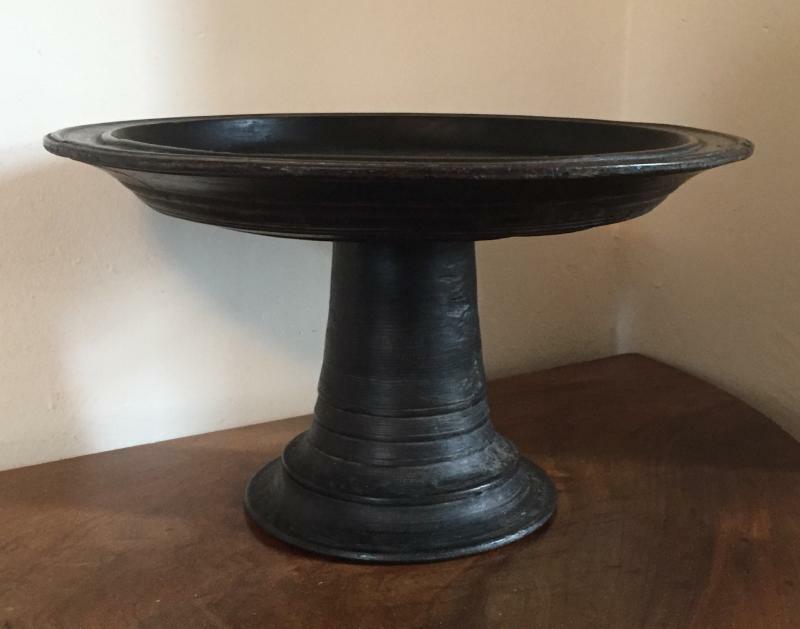 19th c. Balinese offering plate - turned wood pedestal tazza. 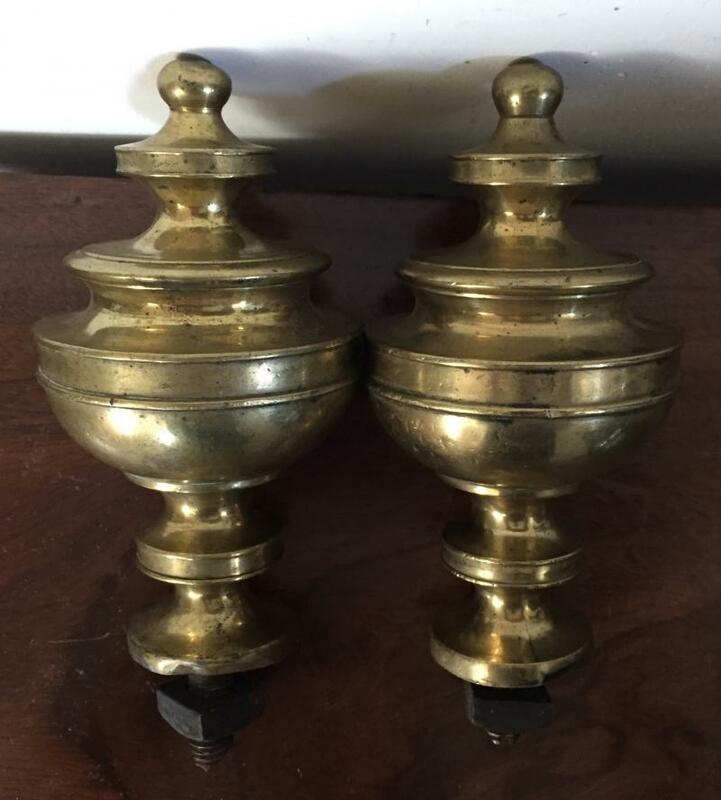 Pair American Federal brass urn form fence gate post finials with iron bolts c. 1800. 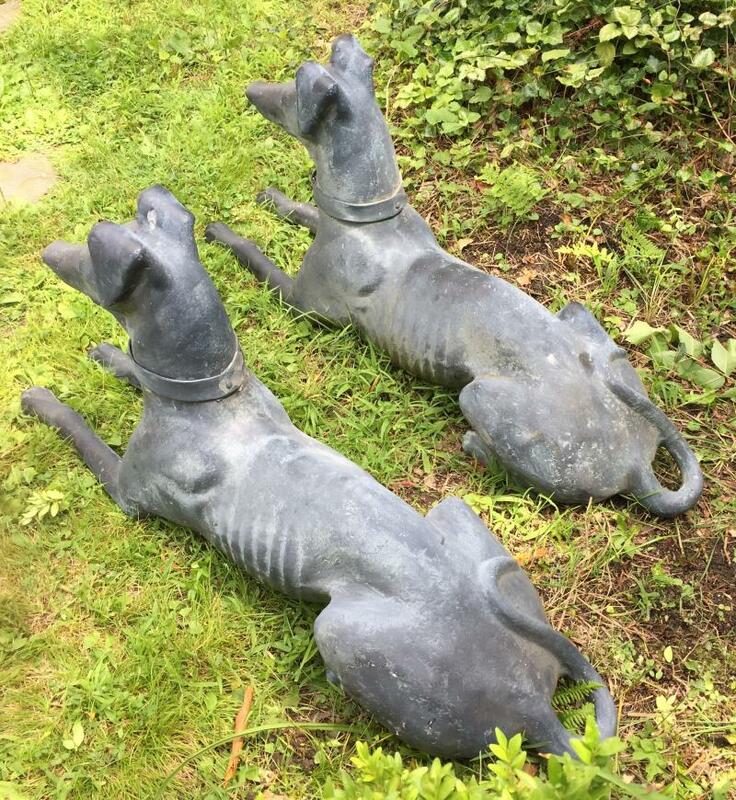 Pair Large 19th c. Cast Iron Whippets measuring 36.5" long - to flank an entrance - Robert Wood & Co., Philadelphia c. 1870. 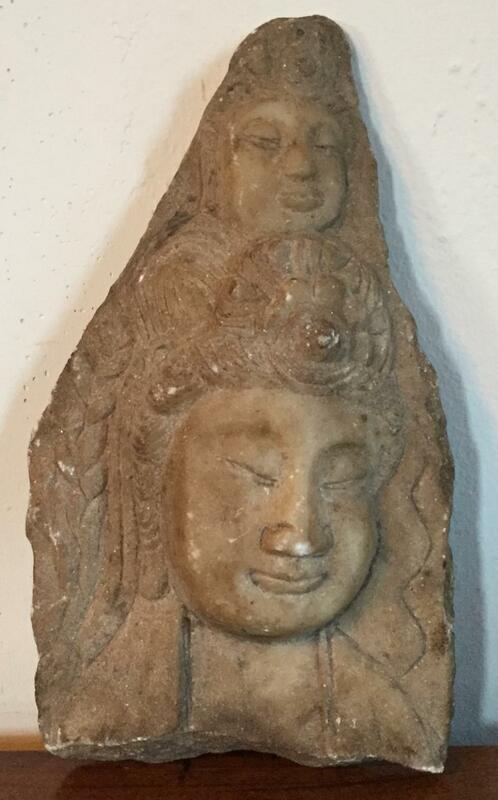 Carved stone double Buddha plaque. Large Chinese porcelain frog planter with fitted carved wood lily pad stand - 19th century. 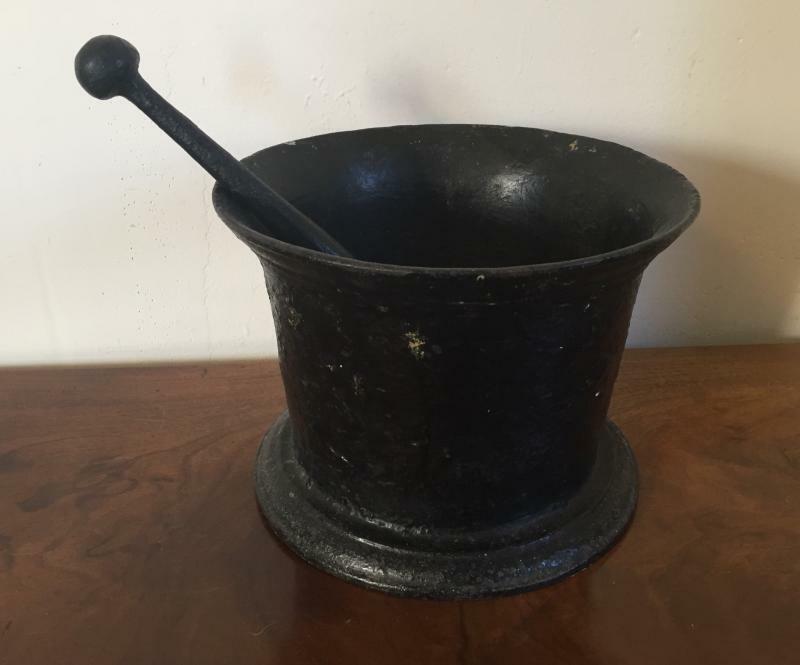 Large mid -19th century iron pestle & mortar. Collection 18 Dutch Delft polychrome tiles decorated with scenes of children at play. 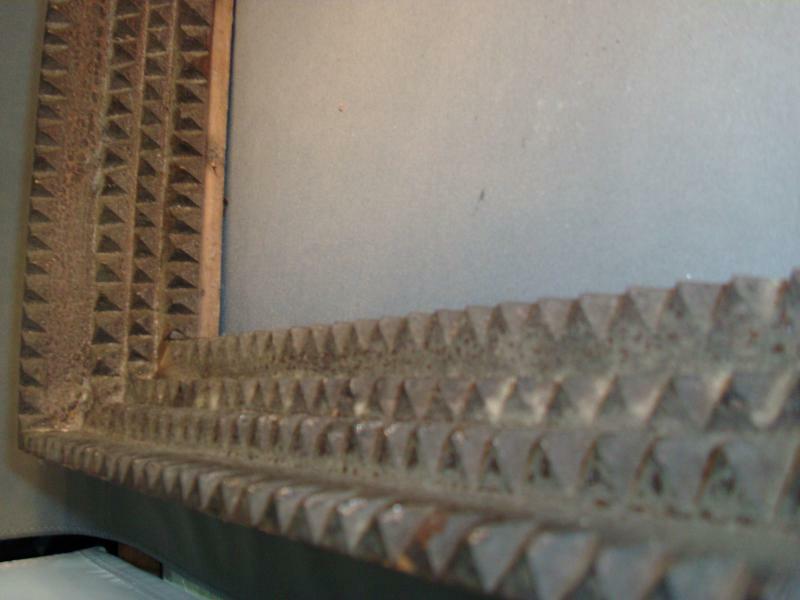 Framed in wood molding for use as a wall hanging - enough tiles for a fireplace surround. Collection 19th c. German topiary ornaments - red berry trees in carved wood flower pots. 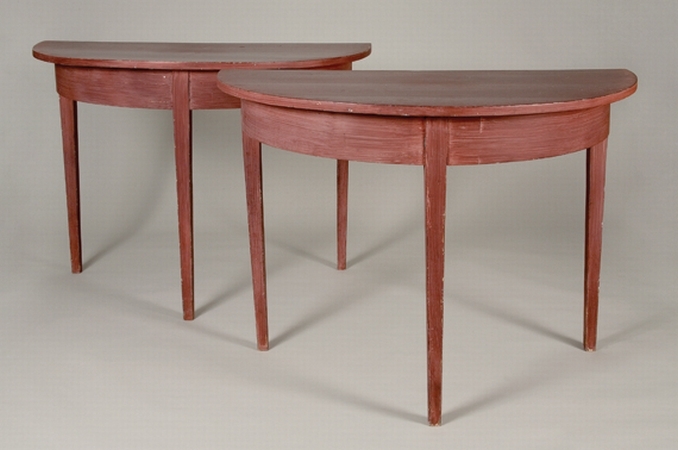 PAIR Continental Demilune Tables - claret paint decorated finish. May be joined to form a dining table or used as consoles - 19th c.
Measurements: 30" tall x 41.25" across the back (diameter of round when placed together). 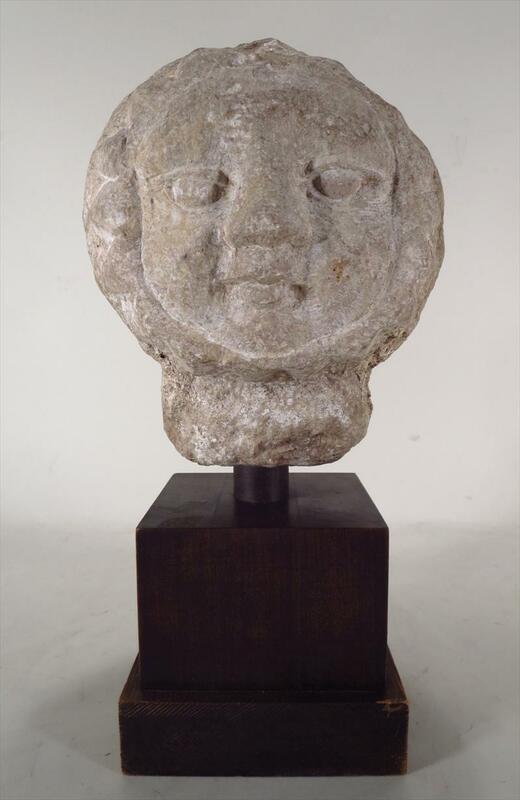 Art Deco carved stone garden ornament - bust of the sun c. 1930. Porcelain potatoes naturalistically molded and hand painted. 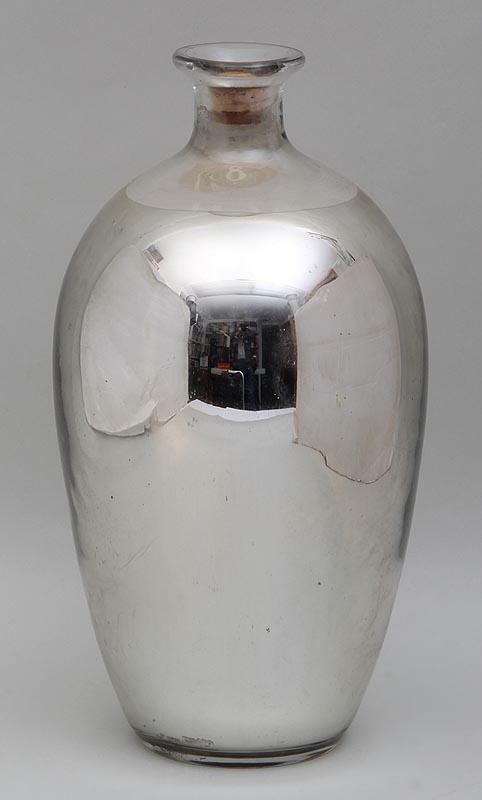 Tall 19th c. mercury glass vase with original cork stopper. Measures 12 1/4" tall. South Seas / Samoan carved and paint decorated wood figure of a warrior - 19th century. 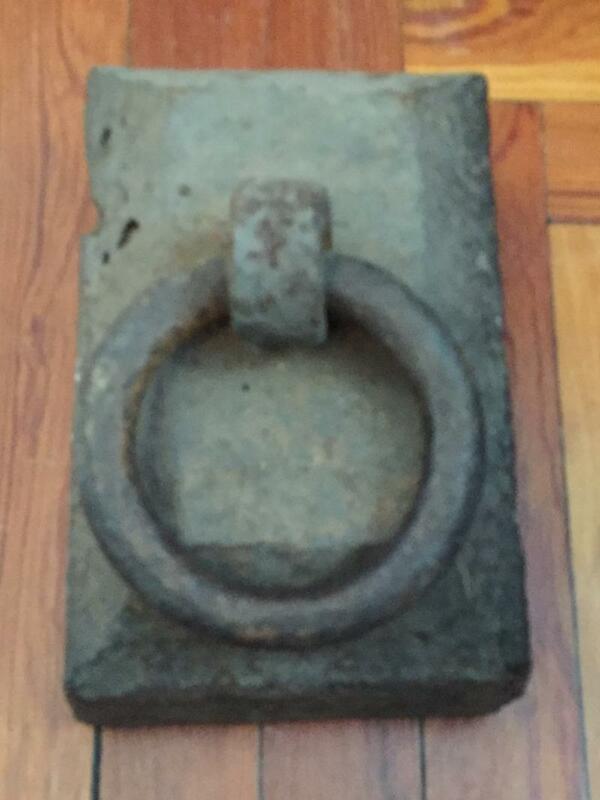 Large and heavy 19th century American cast iron carriage weight or portable hitching post used to tether the horses. Art Deco rouge marble urn with gilt bronze sunflowers. 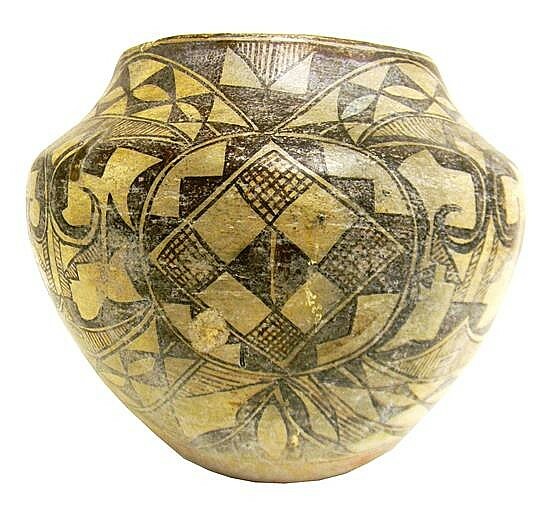 Large 19th c. Acoma Pueblo pottery vase. 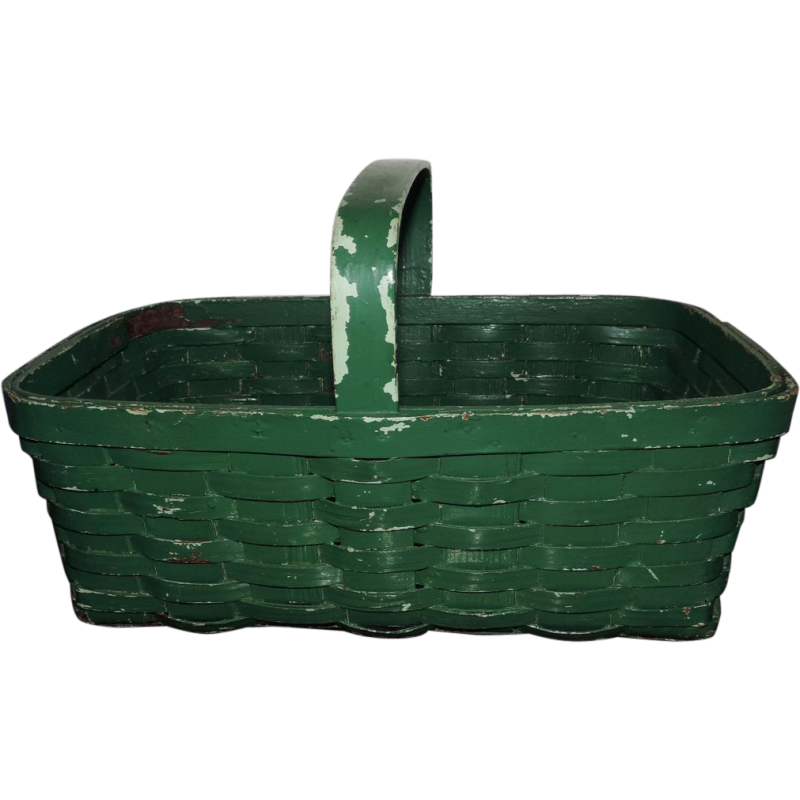 19th century paint decorated hand woven splint baskets. Antique 19th c. American folk art carved stone figure of a lamb. 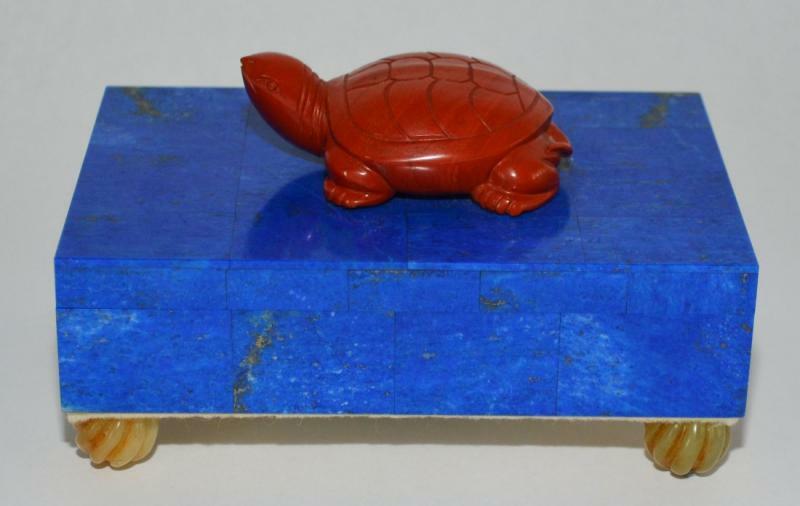 Lapis lazuli box mounted with carved semi precious jasper turtle and carnelian feet - perfect for jewelry or the desk. 19th c. inkwell in the form of an alligator. 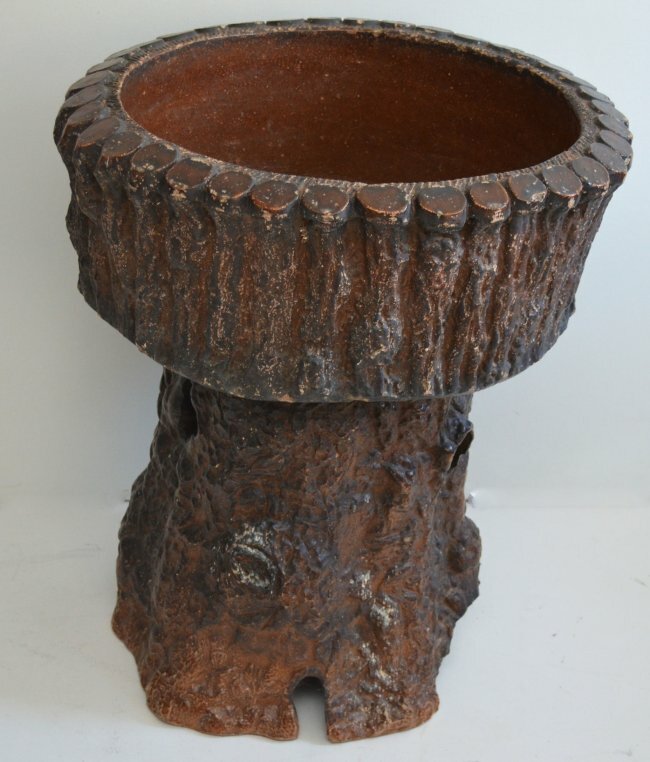 19th century two part stoneware planter naturalistically molded as a tree trunk in the Adirondack taste. 19th century English pottery figure of an Elizabethan woman. Pair 19th c. French breche violette purple marble stands fitted in gilt bronze. 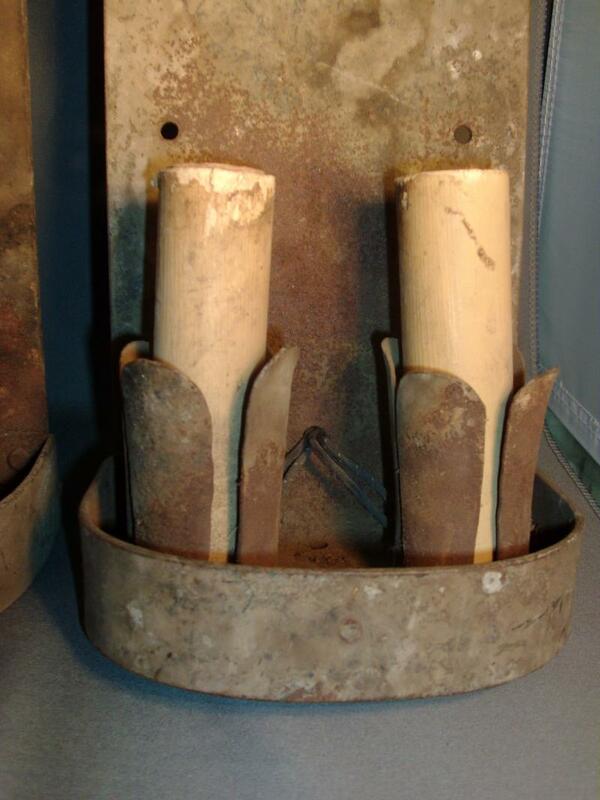 Suitable base for mounting porcelains or lamps. Useful as a display pedestal for sculpture. Each measures 9.5" across x 2.25" thick. 19th century paint decorated tole hall lantern of octagonal shape. Lead squirrel garden ornaments - early 20th century. 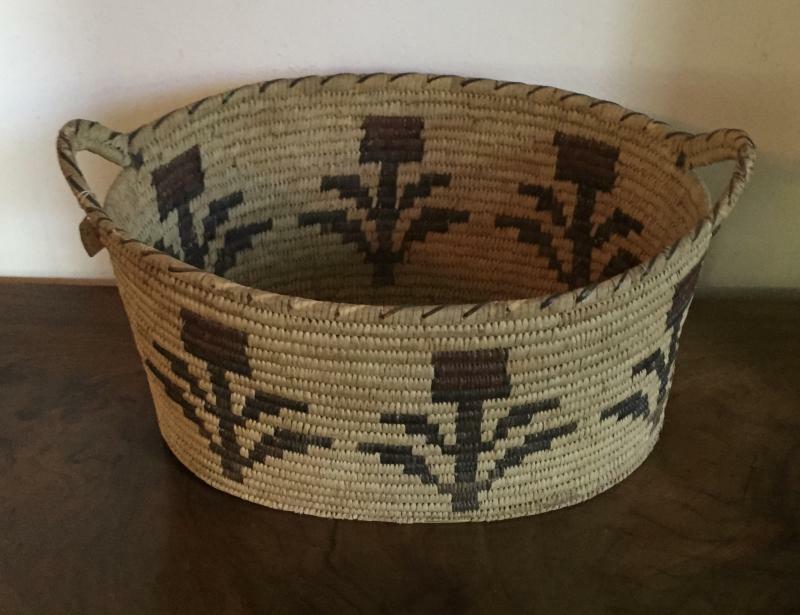 19th c. Native American Indian basket with traditional geometric motif. Very large Chinese porcelain blanc de chine model of a pigeon or parrot with interesting orange peel glaze - 19th c.
Carved Victorian foot stool in the form of a horse shoe with brass mountings. 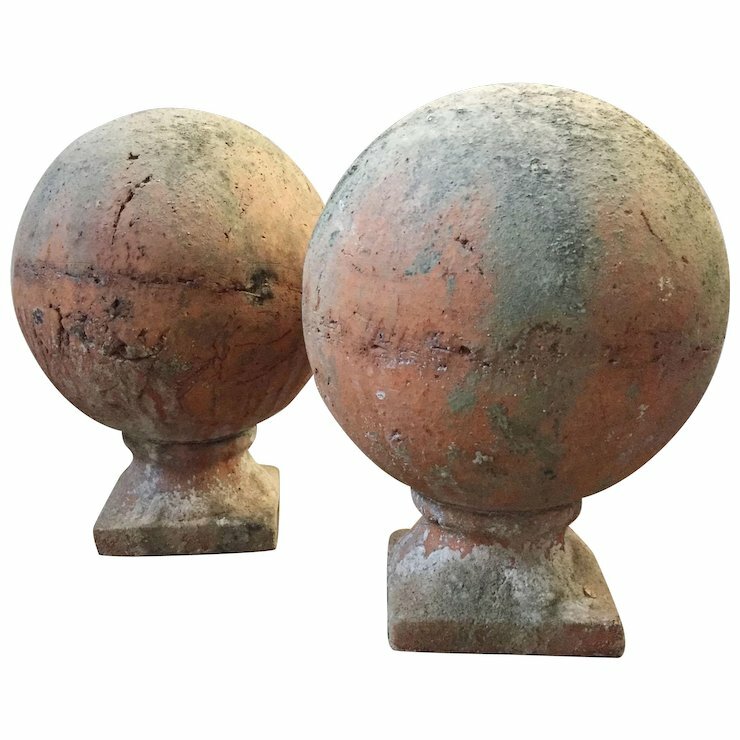 Large pair of mercury glass witch's gazing spheres for the garden or sun room. Each measures 12" in diameter. 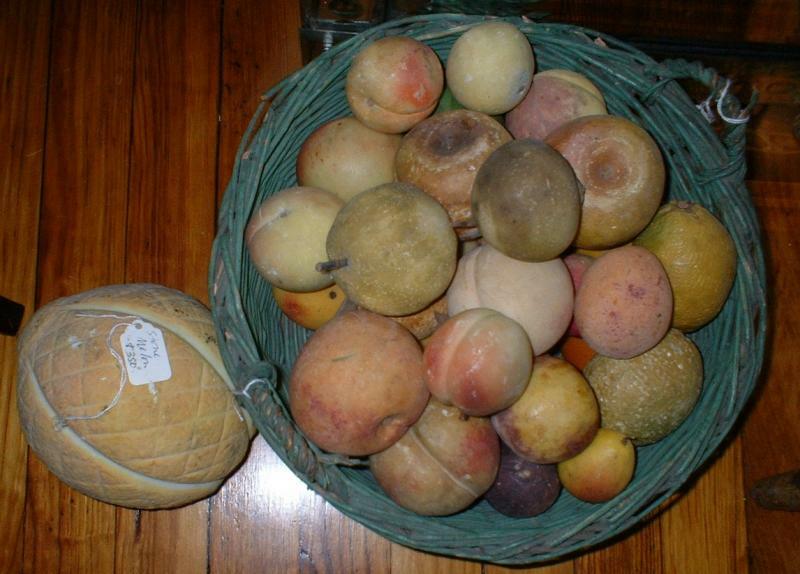 Selection of fruit form pin cushions. 19th c. mahogany game board with clay marbles. 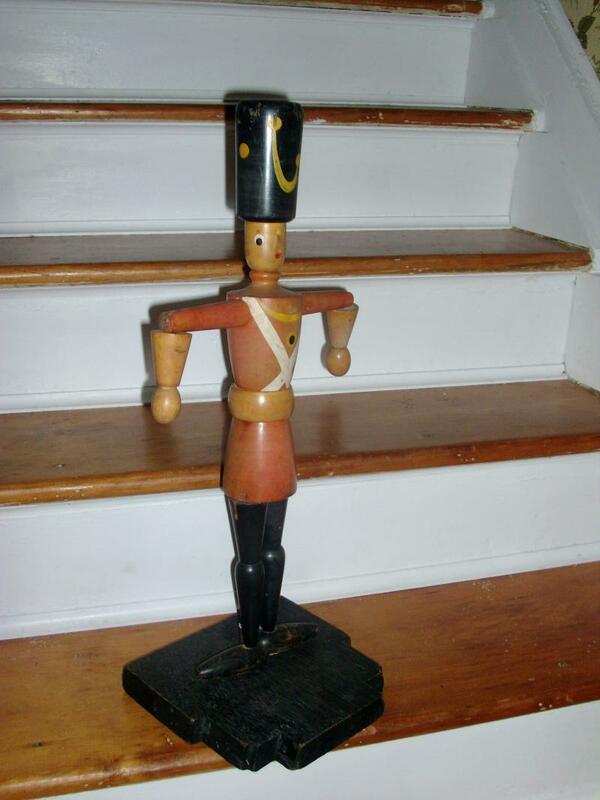 Early 20th c. paint decorated German wood soldier on stand with moving joints. Probably a store display for Christmas. Inspired by the Queen's Guard and the ballet Nutcracker.Measurement: 24" tall. 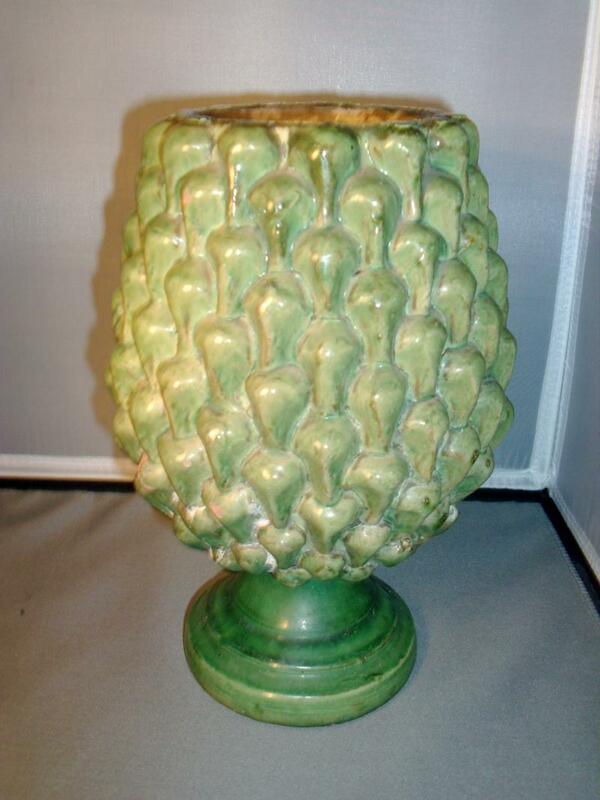 19th c. French majolica urn in the form of a large pine cone.Measurement: 10" tall. 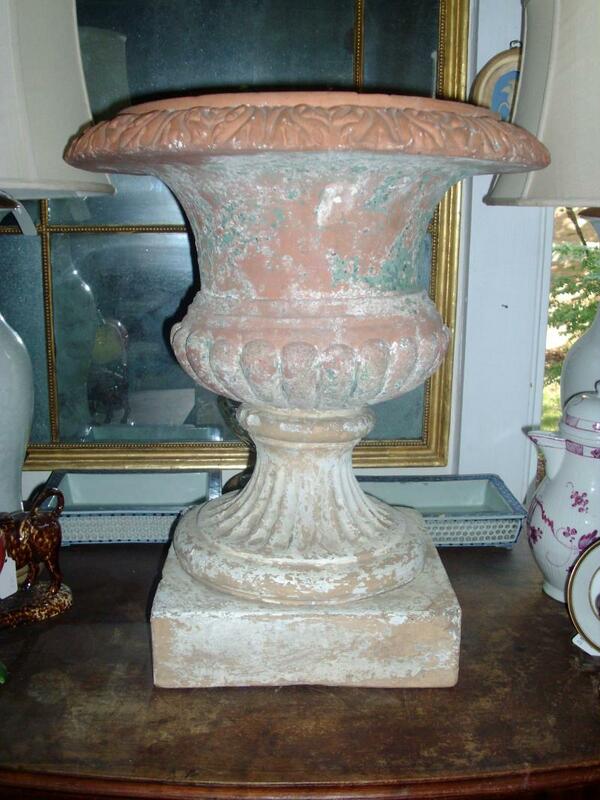 Late 18th c. English Terra Cotta Urn - breaks down into 3 pieces - plinth, stem and pot - wonderful patina. Arts & Crafts large lead sconce - early 20th. c.
Pair 19th century faux rouge marble carved wood corbels as wall brackets in the Beaux Arts taste. 19th c. American paint decorated wood box with original surface. 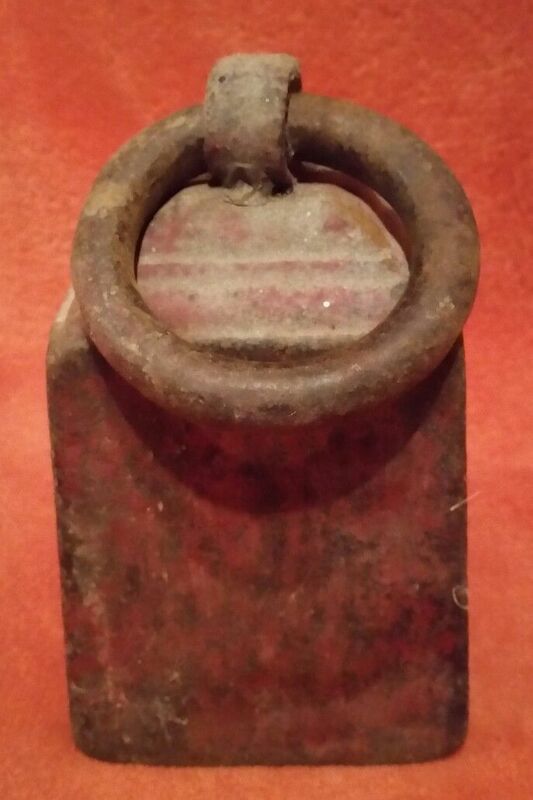 Sculptural 19th c. cast iron boot scraper - extremely heavy. Large Fulper Bulb or Bonsai Pot in blue / green flambe glaze - early 20th c.
19th c. Chinese Picnic Basket with carved wood sides and tooled brass carrying handle. Makes a great side table. Giant Italian Floor Vase - c. 1930. Four Large Federal Gilt Brass Drapery Tie Backs with flower head decoration c. 1820. Victorian Paper Scrollwork on velvet depicting strawberries in a lacy glass Sandwich compote. 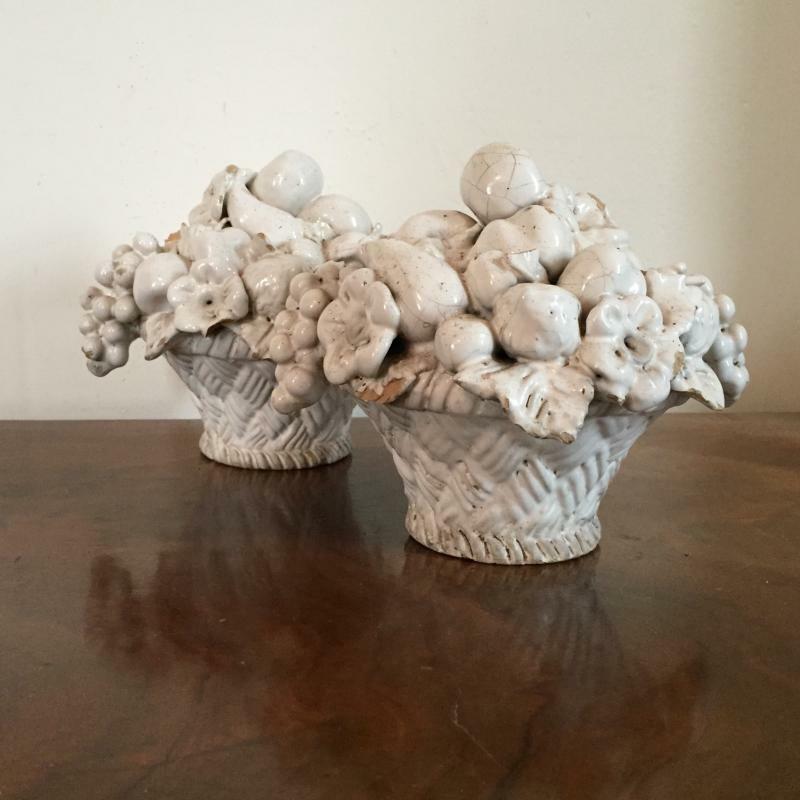 Naturalistic Models of Mushrooms - France 19th c.
Group of four Louis Philippe Garden Urns. Giant Life-like Stone Cantaloupe - 19th c.
Selection of American Indian Baskets and Blankets. Selection of Fire Tools and accessories including andirons and fenders. French Tole Urn with painted decoration - 19th c.
1930's Bellhop Puppet made of wood - original surface. All joints move. 19th c. Mercury Glass Garden Globe in gold. 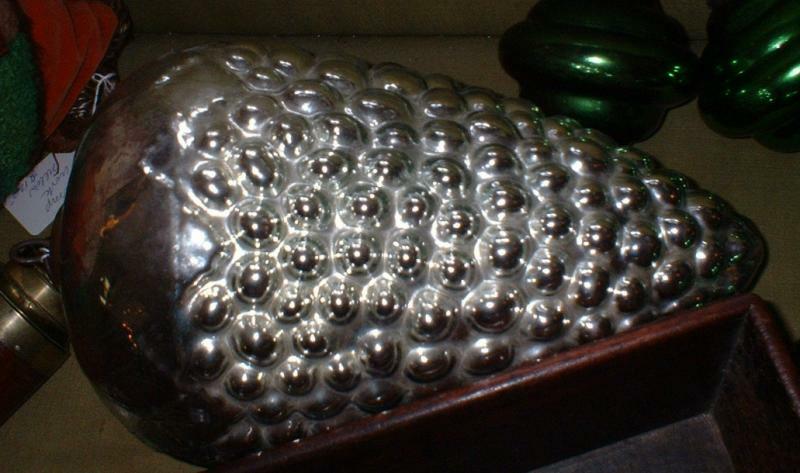 19th c. Mercury Glass Kugel. Collection of 19th c. Garden Tools. French and English, blacksmith made. 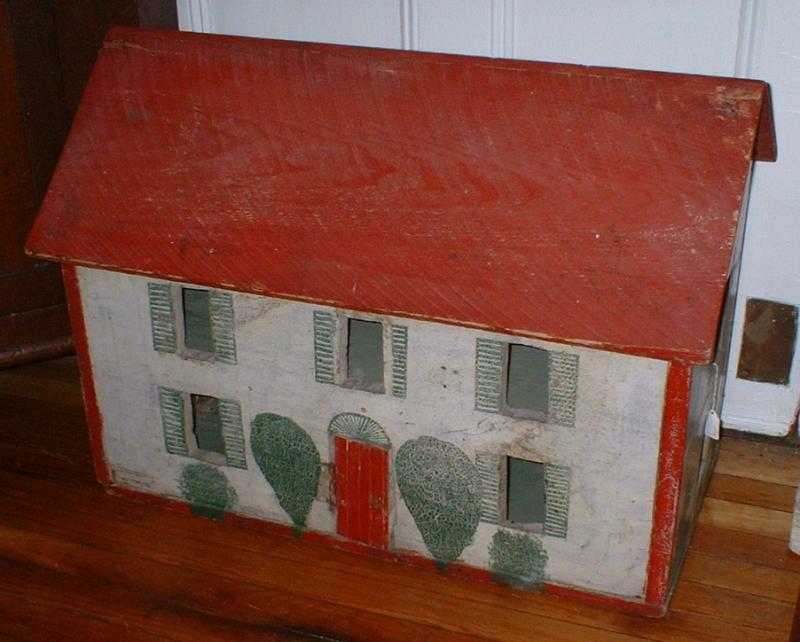 Paint Decorated Doll Houses early 20th c. in original surface with open back giving access to individual rooms. Collection of Paint Decorated Wooden Apple Boxes with wonderful surface and color - c. early 20th c.